Use Your Rolex Serial Numbers/Number To Date Your Rolex Timepiece! Where Can I Find The Serial Numbers On My Rolex? Use Rolex Bracelet Clasp Codes To Date Your Rolex! Difference Between Rolex Warranty Cards In USA And Overseas Explained! 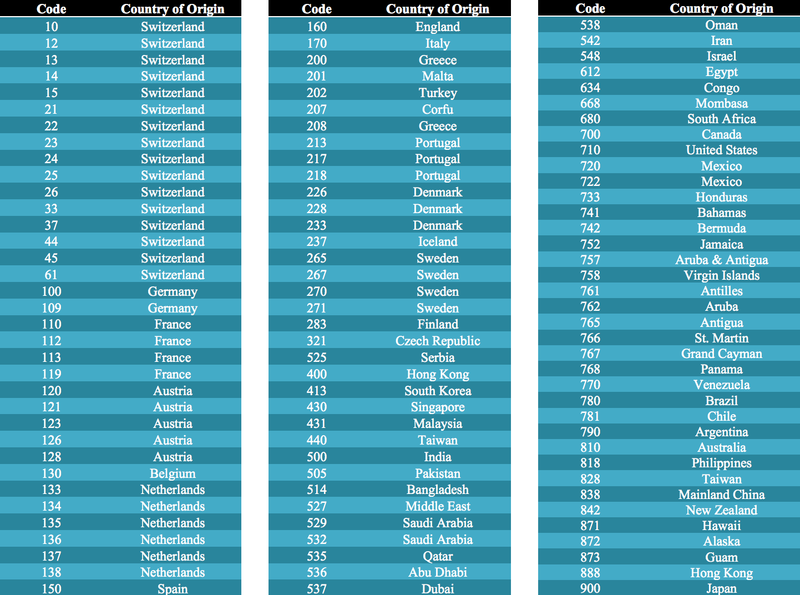 Rolex Country Codes: Where Was Your Rolex Purchased From? Let’s Get Technical: Rolex GMT Master II 16710 “Stick Dial” Explained! Let’s Get Technical: Rolex Submariner’s “Short Feet Dial” Explained! Rolex Solid End Link Bracelet: What Makes A Rolex Bracelet SEL? Rolex Bi-Color Ceramic Bezel: Finally Possible & Truly Beautiful! 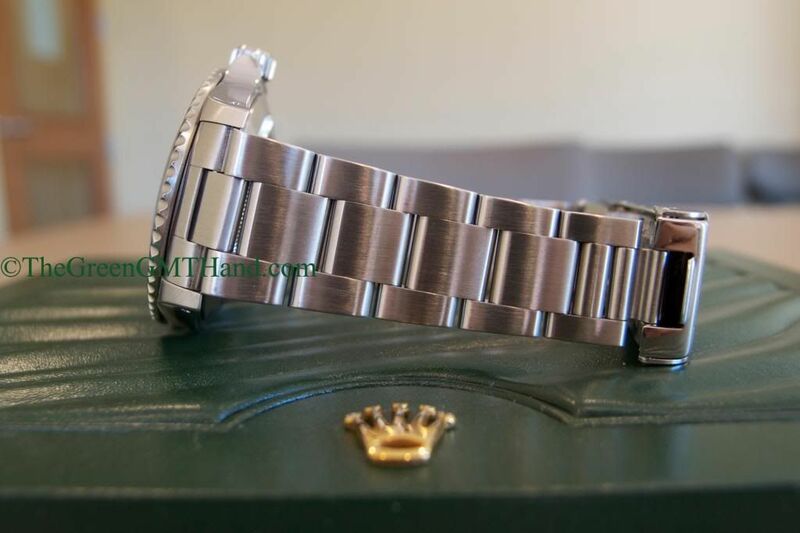 Rolex 16610LV Aluminum vs. 116610LV Ceramic: From Anniversary To Hulk! 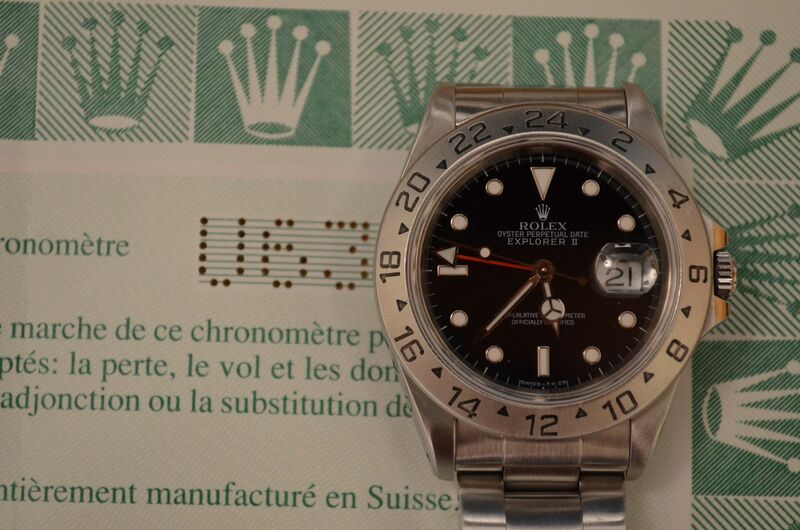 Mysterious Rolex Red Letters On Warranty Certificates: A Puzzle Solved! Rolex Matte vs. Gloss Dials: What Is The Real Difference? Let’s Get Technical: What Is An “Open Six & Open Nine” Date Wheel? Rolex Watch Collecting Terminology: What Does New Old Stock Mean? Saint Bernard The Dog: Rolex Precious Metal Stamping Explained! Rolex & Tudor Helium Escape Valve: Why Do Many Diver Watches Have HEVs? Rolex Engraved Rehault: What Is It and Why Does Rolex Use It? Rolex Roulette Date Wheel: What Is It & Which Specific Models Have It? Rolex serial numbers are very useful in determining the approximate age of your Rolex timepiece. When combined with the bracelet clasp code, Rolex serial numbers can also be used to determine the originality of the bracelet. Below you will find very clear tables/charts on how to determine your Rolex’s age. In 1987, Rolex did away with the traditional numeral only system of serial numbers, and began the letter prefix system. 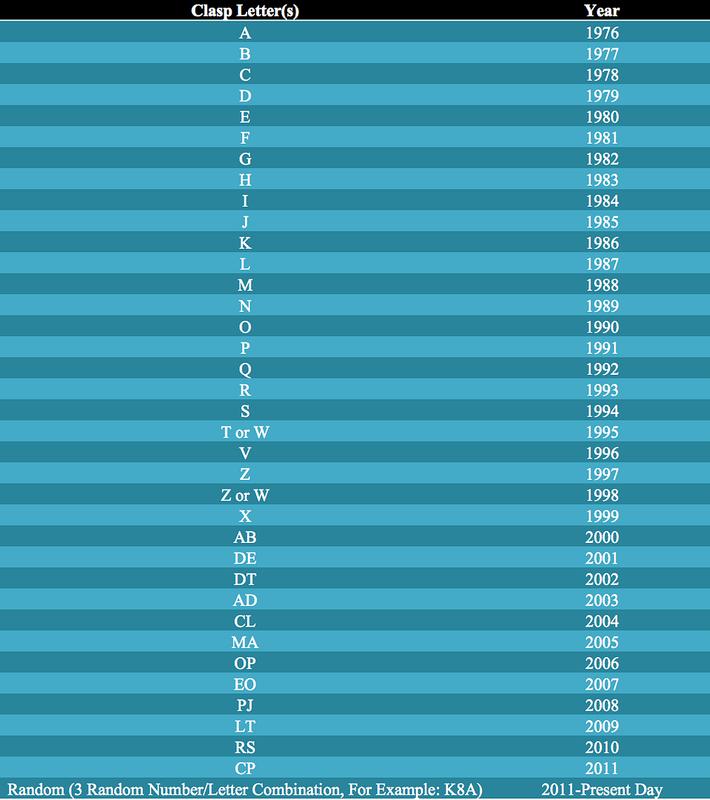 The first letter prefix, R, was introduced in 1987. This system of serial numbers begins with a letter in the alphabet, and 6 digits of Arabic numerals follow that said letter. After 23 years of using this system, Rolex abandoned the letter prefix system and switched to the new scrambled/random serial number system in 2010. 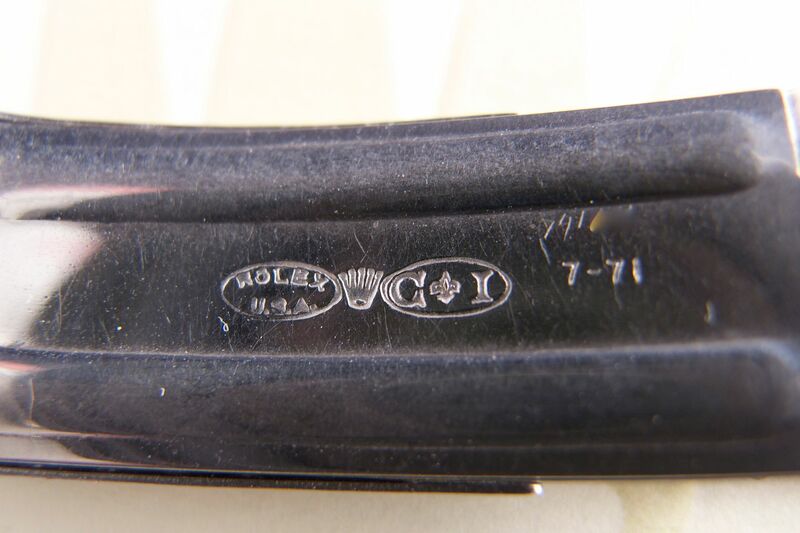 This style serial number contains 8 digits of a mixture of alphabet letters and Arabic numerals, making it impossible to date your Rolex without examining the warranty card issue date. 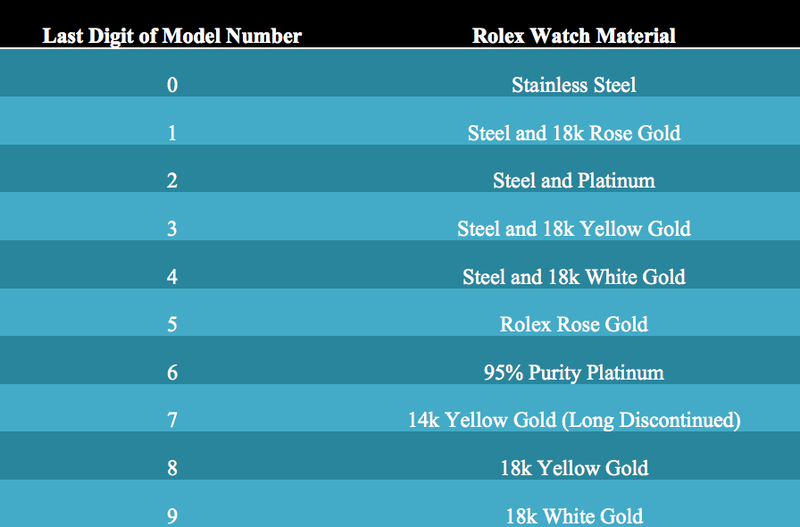 The Rolex serial number table below will nonetheless be helpful to any Rolex owner or potential owner. Prior to 1987, Rolex used a serial number system based strictly on Arabic numerals. At first it was 5 digits, then 6, and finally 7 before being discontinued in favor of the letter prefix system seen above. The serial number chart below will help you date your Rolex’s approximate production date if the said Rolex is made prior to 1987. Do note that the chart below is very approximate at best. Vintage serial numbers are much more difficult to accurately date than the letter prefix serial numbers. As Rolex does not publish its serial number age information, and we are not affiliated with Rolex in anyway, this is merely a helpful chart we have to approximate production date. Use this chart as an excellent way to gauge a tight window of production date for your vintage Rolex timepiece. Where Can I Find The Serial Number On My Rolex? 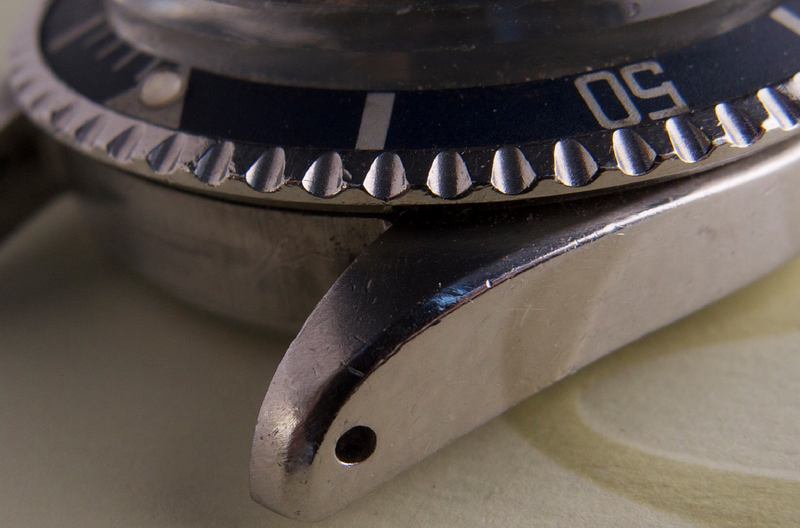 Rolex serial numbers can be found at the 6 o’clock lug when the bracelet is removed, as seen in my photo below. Starting in 2003, Rolex began to engrave serial numbers along with the word “Rolex” on the inside wall of the case (also known as the rehault). 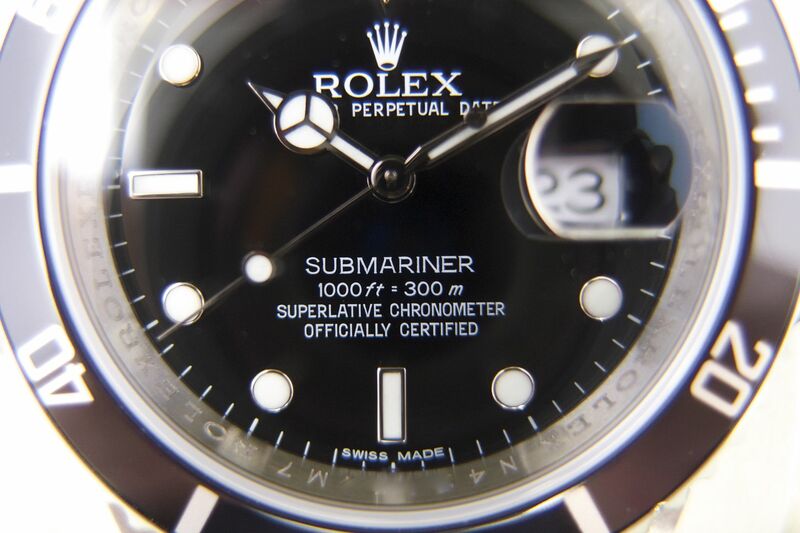 Sport models like the Submariner 16610 received the engraved rehault in 2006/2007 during the late Z serial number issues. And in 2010, beginning with the late V serial numbers, Rolex serial numbers began to disappear from the 6 o’clock lug, and on current models the serial number can only be found on the rehault. Below is a picture of an engraved rehault with the serial number at the 6 o’clock (serial is partially blurred out). Use Rolex bracelet clasp code(s) to date your Rolex! Rolex clasp codes can be found on two different locations on a Rolex timepiece. 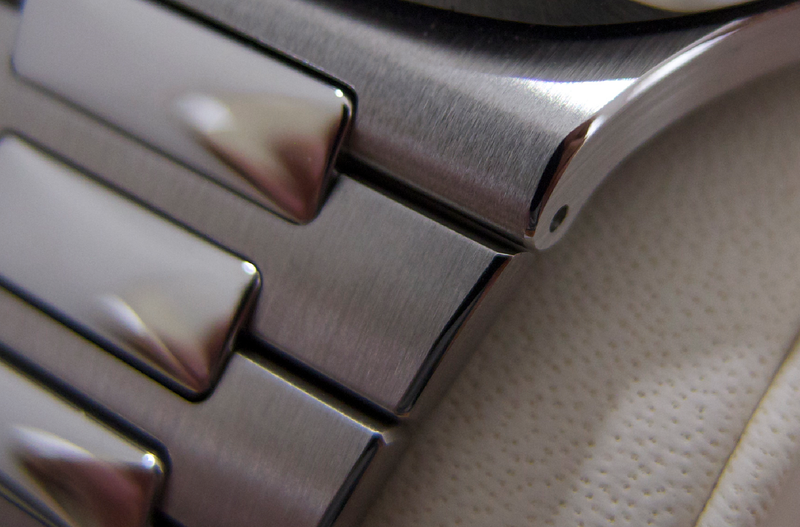 The first and most obvious is on the Rolex bracelet clasp, seen below. 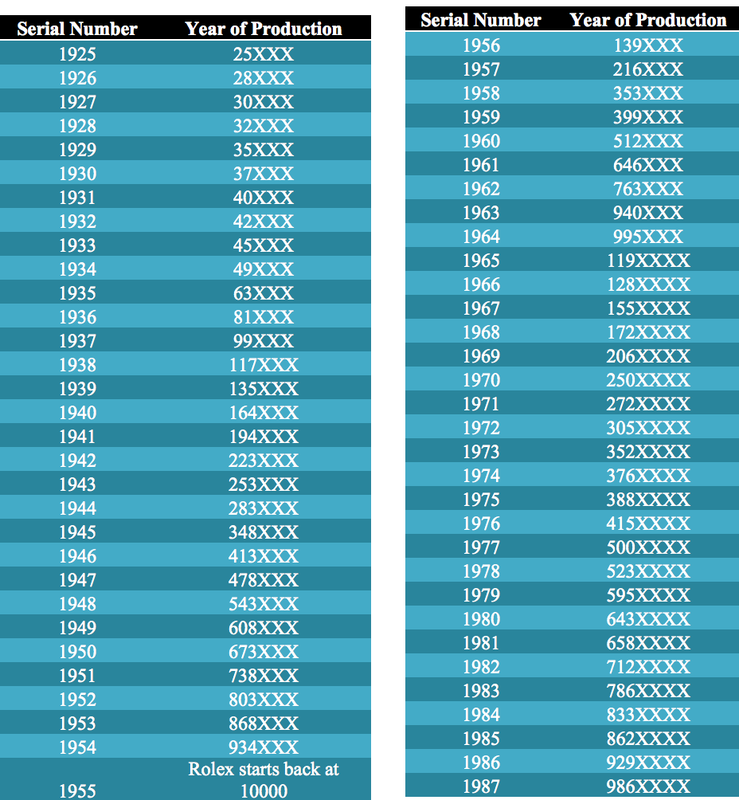 We have gathered a chart below with Rolex clasp code letter designations by year beginning in 1976 when Rolex began the practice. Each clasp code begins with one or two letters, followed by a number 1-12. 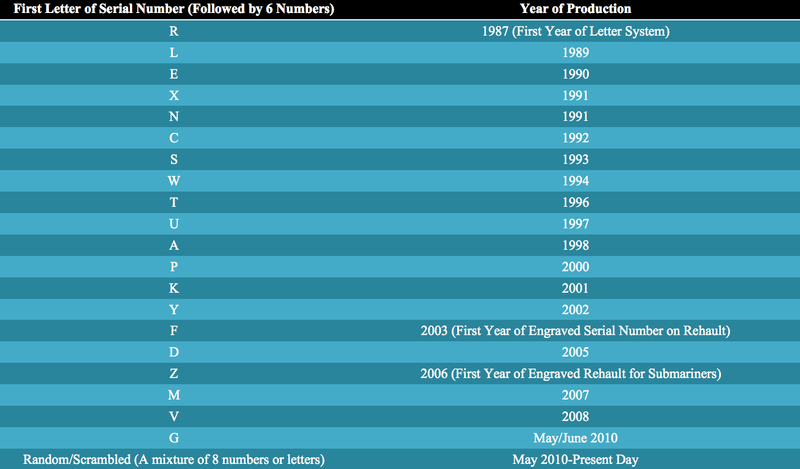 The letter(s) indicates year, and 1-12 indicates month. The clasp code X4 seen here below denotes 1999 April. Beginning in 2011, Rolex did away with the previous system of clasp code configurations, and switched to a completely random 3 digit clasp code system. The 3 digits can be all numbers, all letters, or both. Frankly, the new clasp code system is purposefully random, and designed to tell us nothing about production date. This change makes sense since Rolex switched to random serial numbers, the clasp code was the next in line to be made random/scrambled. 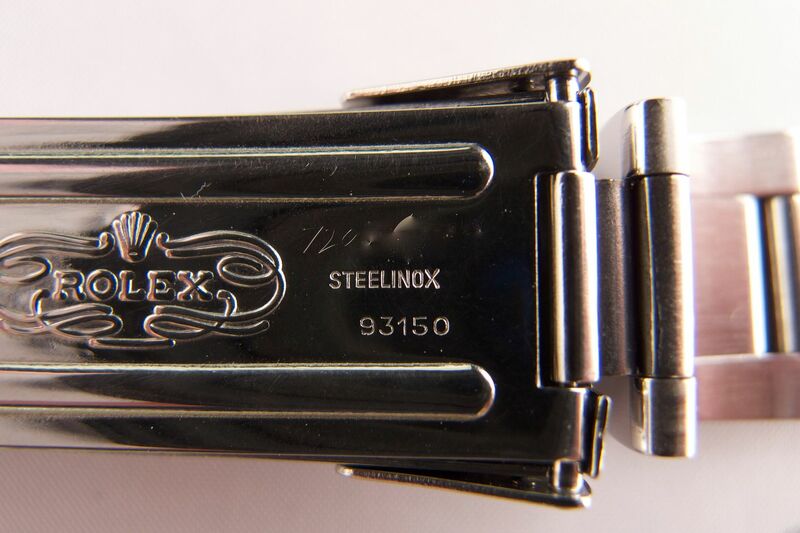 See below for example of a new random clasp code on a new style 2013 model Rolex. The second place to find clasp codes on a Rolex watch involves removing the bracelet from the watch. 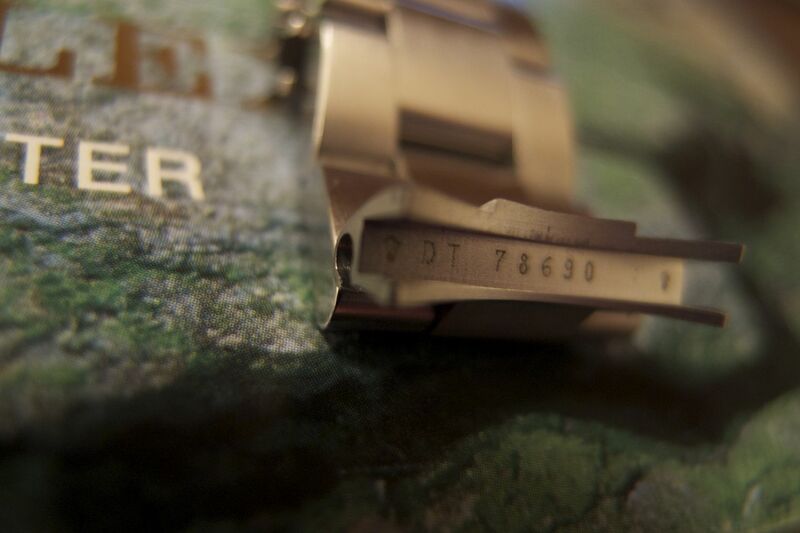 As seen in the example below, the clasp code DT (2002) along with the Rolex bracelet model number are engraved inside the end link. Addendum: “U” clasp code can be found in Rolex watches produced in 1996, 1997, and as late as 1998 in the A serial number. 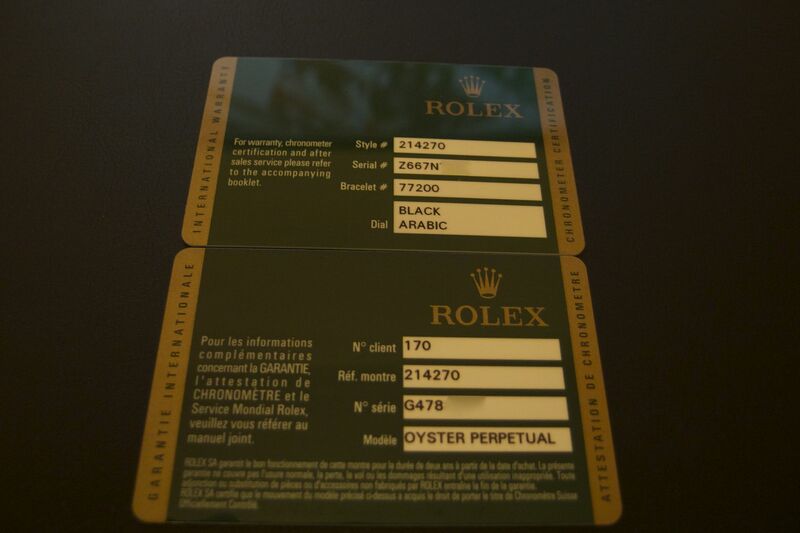 Below we have two Rolex warranty cards for two different Rolex model 214270 39mm Explorers. On the top we have a USA style warranty card, for a random serial beginning with Z Explorer to be sold in the USA market. On the bottom we have an overseas warranty card, for a G serial Explorer to be sold in Italy (country code 170). For an explanation and breakdown of different Rolex country codes, please refer to the next section on Rolex country codes. Note the USA warranty card is in English, and lists the serial number (partially blotted out), model number, Rolex bracelet reference number, and dial design. 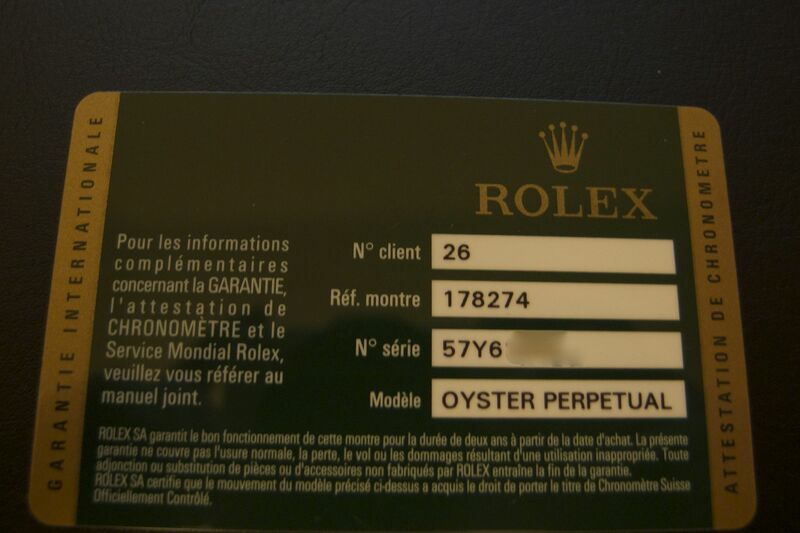 The overseas warranty card is in French also lists 4 items: Rolex model and serial numbers like the American card, a country code called N client, and a “modele” category. 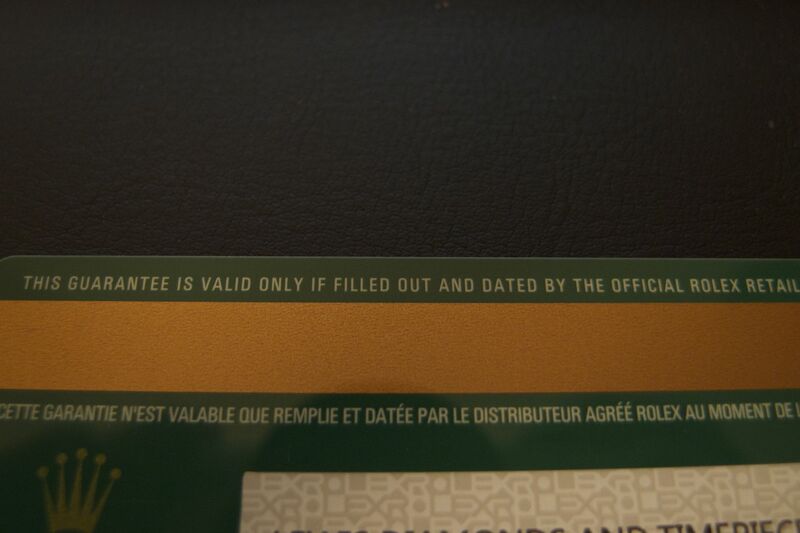 Common to both warranty cards, the name of the authorized dealer from which the Rolex timepiece was purchased from will be listed on the back. Below that will have space for the name, address, and date of purchase of the purchaser who first took ownership of the watch. Even the folders that the two style warranty cards arrive in are different. The USA warranty cards are packaged in a paper folder with cutout for the relevant information, and the overseas warranty cards are presented in a faux leather card holder, also with cutout for the Rolex model number and serial number. See below for example. Lastly, note that the USA cards are used for all Rolex timepieces sold by USA authorized dealers, and overseas Rolex warranty cards are used by every other region/country in the globe not in the USA, with special code designations to differentiate. See our next section for a full explanation of Rolex country codes. 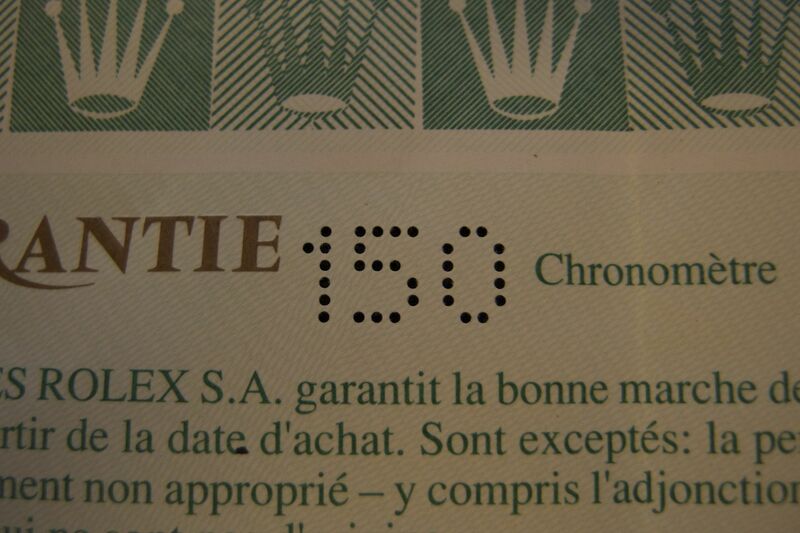 Today, with the exception of its watches sold in the USA, Rolex stamps a country code on the warranty card of each of its timepieces sold. Below is a discontinued style of Rolex warranty certificate, where you will find the country code punched into the warranty paper. Per our chart below, the code 150 means this Rolex timepiece was originally purchased from a Spanish authorized Rolex dealer. 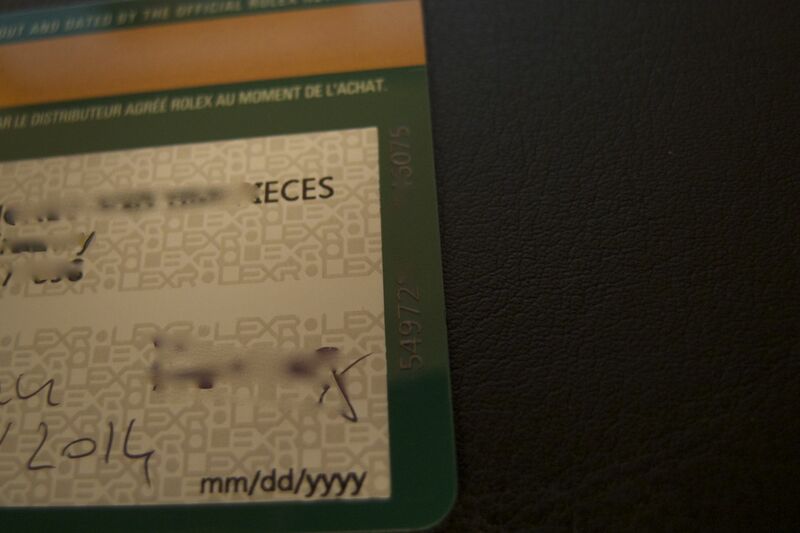 Today Rolex issues a warranty card (no longer the warranty certificate seen above) with each timepiece it sells, and the country code is denoted “N Client.” Below you will find the front and back of a warranty card with the country code of 26, which means the timepiece is from a Swiss authorized Rolex dealer. We have compiled here below a list of country codes found on Rolex warranty certificates and current warranty cards. If you have a warranty card with a code not seen below, contact us and we will add it to the chart. Rolex model reference numbers can be found on every Rolex timepiece. In the next post we will teach you where to find the model number on the Rolex warranty certificate/Rolex warranty card, and on the case and caseback of Rolex timepieces. 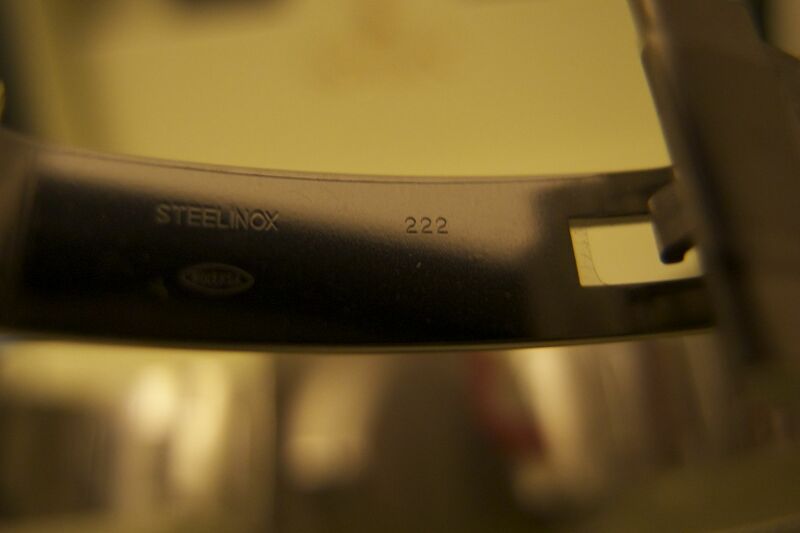 The last digit of the Rolex model reference number indicates the metallic material from which the watch is made of. Below we have compiled a chart detailing those numbers, and explaining their corresponding material. Here below you will find a chart of the most common and popular men’s Rolex professional and sport models from past to present. We have compiled this comprehensive chart to cover the most well known Rolex professional and sport models, from stainless to solid gold, and from vintage to contemporary. Read further below for more information on how to locate the Rolex model reference number. Let’s Get Technical Part I: Rolex GMT Master II 16710 “Stick Dial” Explained! Many Rolex collectors and even novice Rolex aficionados have undoubtedly discovered price differences due to certain physical variations when comparing two timepieces. Condition is a large arbiter when many buyers choose their timepiece. Accuracy and movement condition are other examples. The variety of colors that Rolex offers is another deciding factor. The list goes on and on. In our series called “Let’s Get Technical,” we will identify many iconic vintage and contemporary Rolex models, and explain the many “jargons” that you may run into both on our site and other venues of watch sales. We want you to be educated on the smallest differences that may affect the value of a Rolex timepiece. Stay tuned for more. 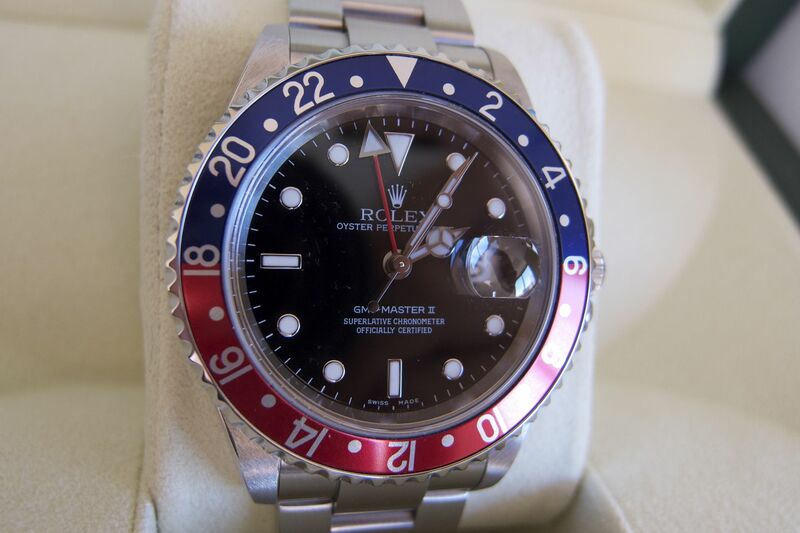 Below you will see a D serial Rolex 16710 GMT Master II “Pepsi” blue and red bezel. Notice the way the “II” is printed on the dial. 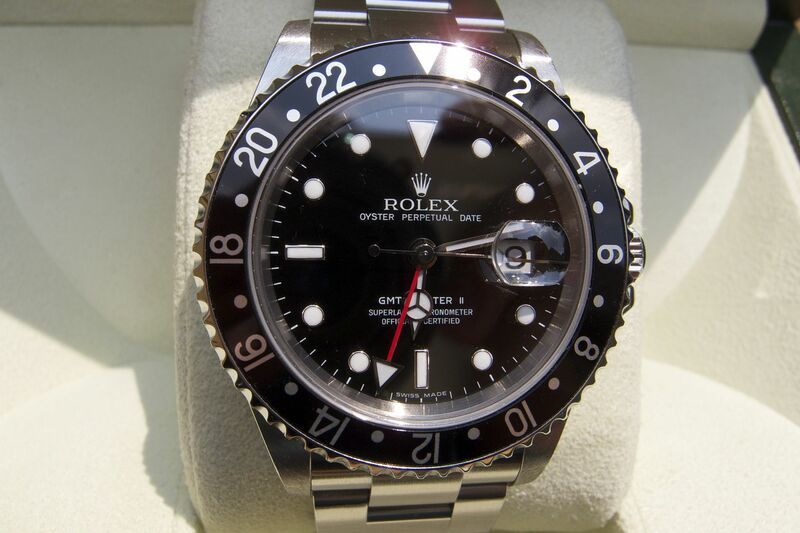 This is a traditional 16710 Rolex GMT Master II dial. Here below we have another D serial Rolex 16710 GMT Master II, this time a black bezel, and notice once again the way the “II is printed on the dial. The roman numeral “II” looks like 2 individual sticks, not connected to one another. This special print is called a “stick dial” for the Rolex 16710 GMT Master II, and was introduced in the D serial for this model. You will see stick dial 16710 GMT Master II’s in the subsequent Z serials, and the final M serial when this model was discontinued in 2007/2008, replaced in favor of the Rolex 116710 ceramic GMT Master II. For the D, Z, and M serials, you will find regular dials, stick dials, and even a third variation called rectangular dials. But the phrase “stick dial” is by far the most popular and most unique description for the late runs of the REF 16710. Whether it is worth the premium, well that is up to you to decide. The introduction of the ceramic bezel into Rolex timepieces marks a major transition point in the history and heritage of this great company. For decades, aluminum (after bakelite) has been the bezel material for iconic models like the Submariner and the GMT Masters. The crossing from aluminum into ceramic bezels aligns with the general direction of the Swiss watch industry as you will find ceramic bezels on many top tier brands’ timepieces today. Ceramic bezels are advertised to be more durable, resistant to salt water and UV rays from the sun (results in less fading), and virtually unscratchable. The advent of the ceramic bezel is an especially pivotal point in the recent history of Rolex because it is usually accompanied by other transformative changes: square lugs, movement improvements, and bracelet updates. 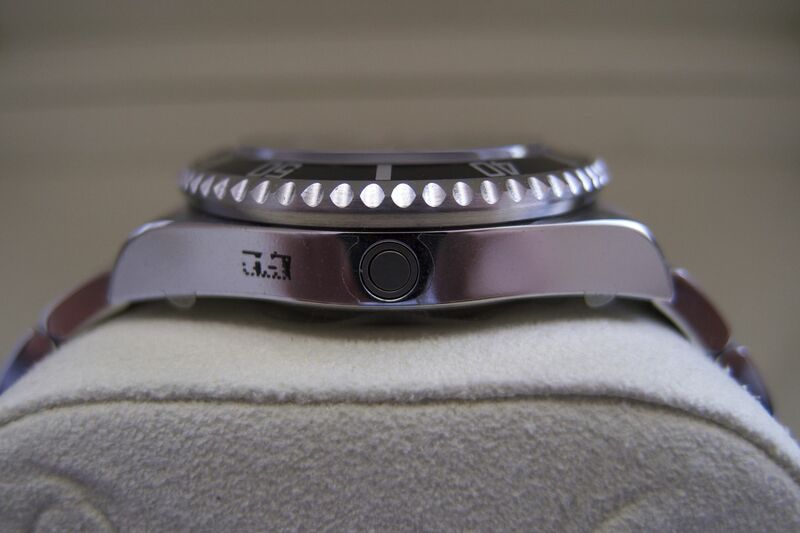 Below is a tried and true aluminum bezel insert on a Rolex 16610 Submariner. It is relatively inexpensive to replace, and actually quite a simple process to replace by most competent watchmakers. Aluminum bezel inserts do scratch easily, and prolonged exposure to the sun and salt water has been proven to cause fading. Yet this has been the bezel insert material of choice for Rolex for decades, and it has performed admirably and very practically. 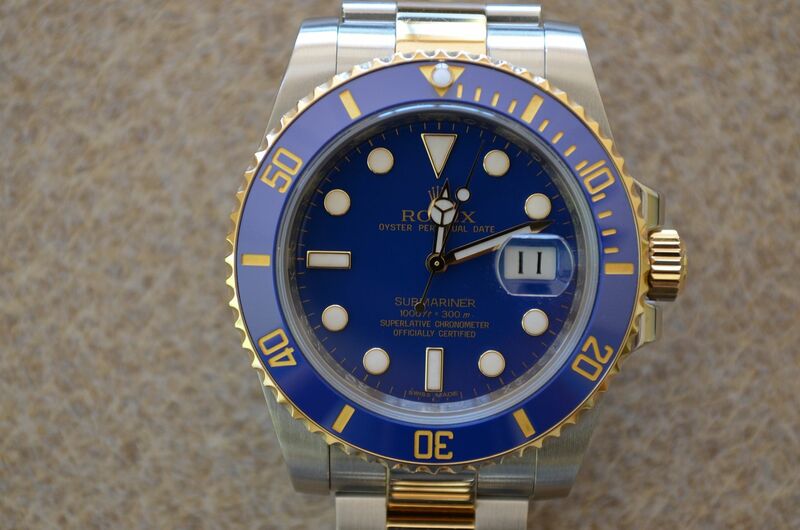 Here below is a ceramic bezel on a two tone Rolex 116613 Submariner blue dial. The blue bezel insert is made completely out of ceramic. Unlike the aluminum insert that has numbers painted on, this ceramic bezel has sunken in numbers that have been blasted at extremely high temperatures with yellow gold particles. When the numerals or markings on a ceramic bezel are silver, it is the result of platinum particles blasted at a high temperature. The result is a shiny, glistening, beautiful, durable, and scratch-proof modern ceramic bezel. Beauty meets toughness! But not all ceramic bezels have gold or platinum blastings and carved markers. Below we have a Tudor Pelagos (Tudor is the sister brand of Rolex) that also features a ceramic bezel. This black ceramic bezel has a smooth surface, and the white markings are actually filled with a luminescent material for night glow. Not only is it very functional, this style ceramic bezel is also inexpensive compared to the 4 figure price tags on a Rolex ceramic bezel, a characteristic very fitting as Tudor was and still is intended to be the more affordable option to Rolex. Lastly, Rolex is not the only company that has transitioned to ceramic for its bezel inserts. Here below we have a Caliber 8500 movement Omega Planet Ocean, equipped with a ceramic bezel. It looks exceedingly similar to the bezel style of the Tudor Pelagos above. However, the numerals on the Omega ceramic bezel do not glow. As luxury Swiss brands make the leap and commitment to ceramic as the bezel choice of the future, buyers benefit from overall shinier and more durable profile of the entire timepiece. As a tradeoff, the cost of the timepieces also rises, and replacing a broken ceramic bezel (however rare) can be very costly. 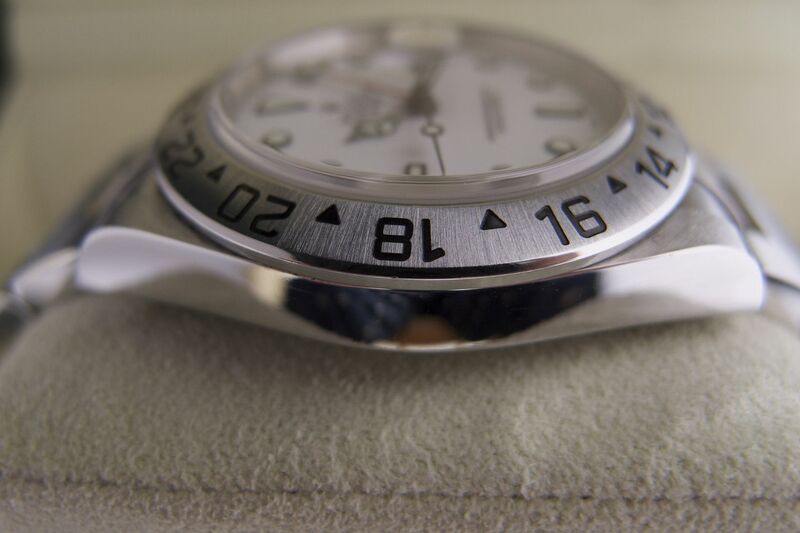 A simple aluminum bezel replacement operation is no longer so simple when it comes to ceramic bezels as it takes special Rolex tools to properly install, or else you risk breaking a $1500 ceramic bezel into two halves. At the end, the ceramic bezel is the present and the foreseeable future, and it sure looks good doing it. 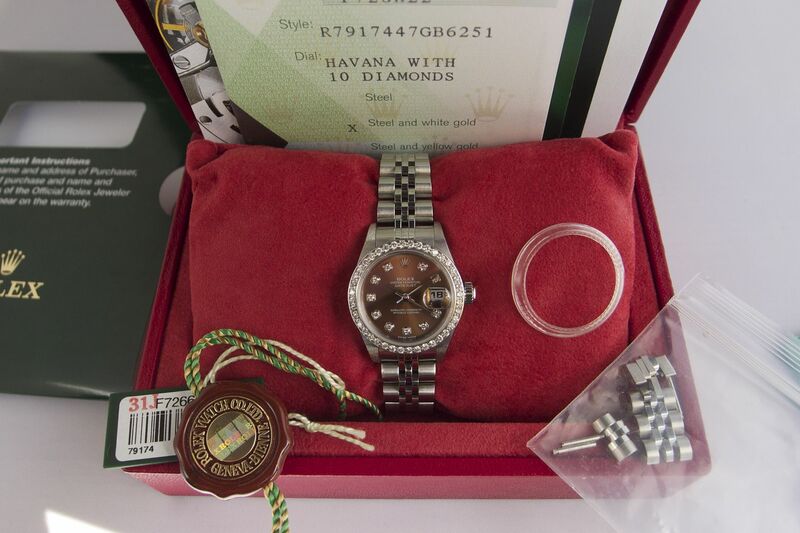 Most buyers want to purchase their Rolex timepieces complete with original warranty certificates, and many want the “complete set” of original boxes, warranty papers, hang tags, and any accompanying Rolex literature manuals. In this section we will examine some different Rolex box designs from the 90’s to present day, and help guide you in identifying the proper, original, and most importantly genuine Rolex box for your timepiece. 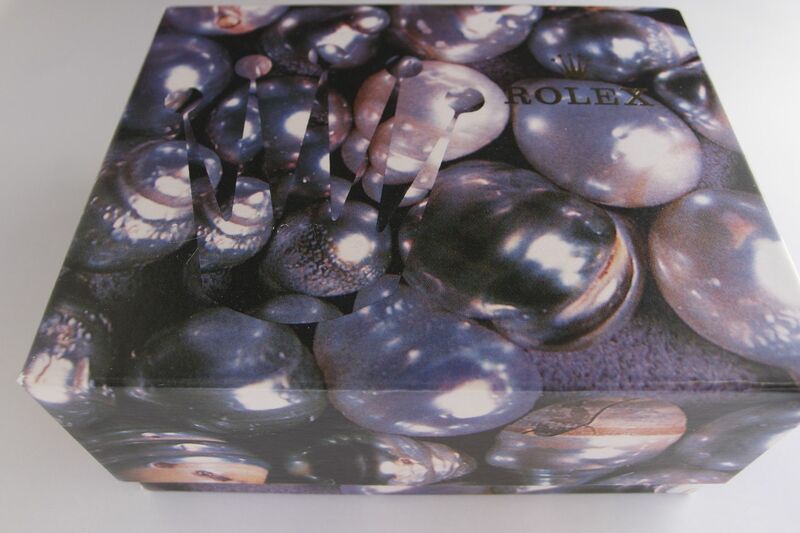 Note that we will also have another section on the many varieties of vintage pre 1985 Rolex boxes. 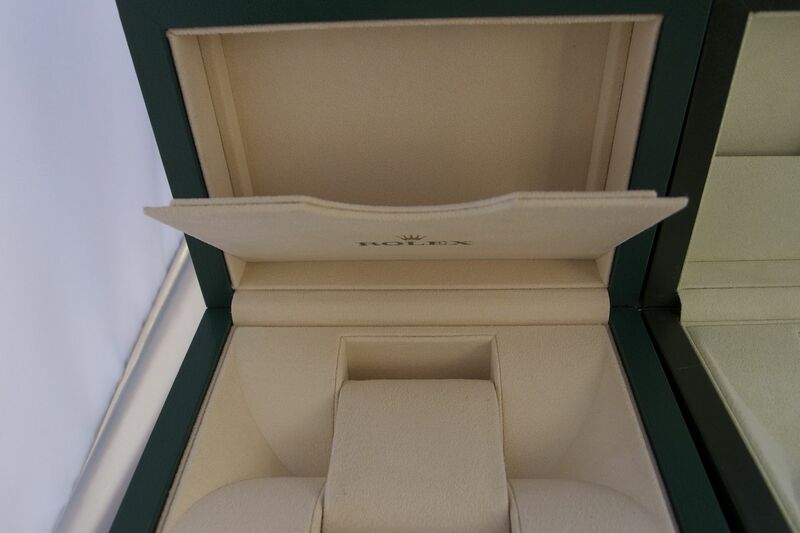 Below we have a typical men’s Rolex green box set with inner pillow inside a wood box. Rolex logo and design is prominent and unmistakeable. A view of the open men’s box from the 90’s to 2005 (use was discontinued completely in 2005). During the same time period, Rolex issued a different red themed box for ladies timepieces. Check out the difference compared to the men’s box from the outside. The inside of the ladies’ box is completely red. This box design was also completely discontinued in 2005 along with the men’s boxes. 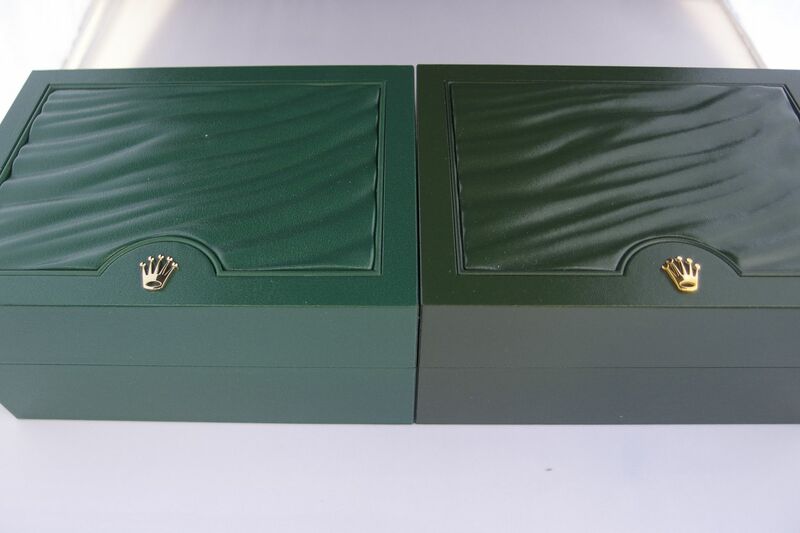 In 2005, Rolex introduced the green wave box set design that is still used today. It is designed to be for modern Rolex timepieces of both genders. Special exotic models like the Rolex Sky Dweller receive their own unique deep green inside suede color. The standard issue boxes come in 3 sizes, and below we have a picture of the size of them compared to the discontinued box design. Small size is issued for stainless steel models. Medium for two tone steel and gold. And the largest box is for solid gold models and the Rolex Deep Sea. For the inside view, see below. These are but just a few of the numerous box designs Rolex has used in the past and present, and we will continue to bring you more vintage box identifications and guides. 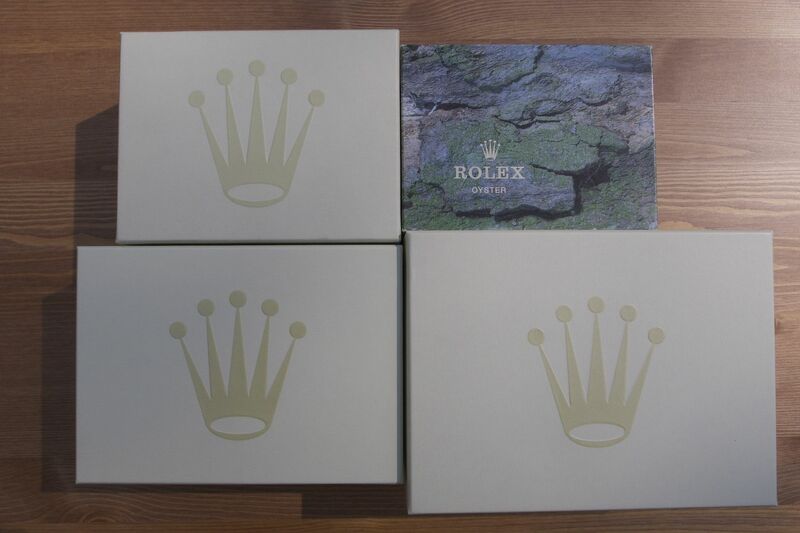 In the meantime, we have a wide selection of Rolex Boxes For Sale here to complete your collection. Previously we went over the characteristics and the pros and cons of the aluminum vs. ceramic bezels, and the latter is commonly found on today’s Submariners, GMT Master II’s, Pelagos, as well as many other Swiss brands. In this section we will examine some of the most common bezel designs of Rolex watches past and present. Below we have two smooth bezel styles. The first is the smooth style found on the Explorer and Milgauss line, and the second is a domed smooth bezel found on the Datejust line. Material is 904L stainless steel. 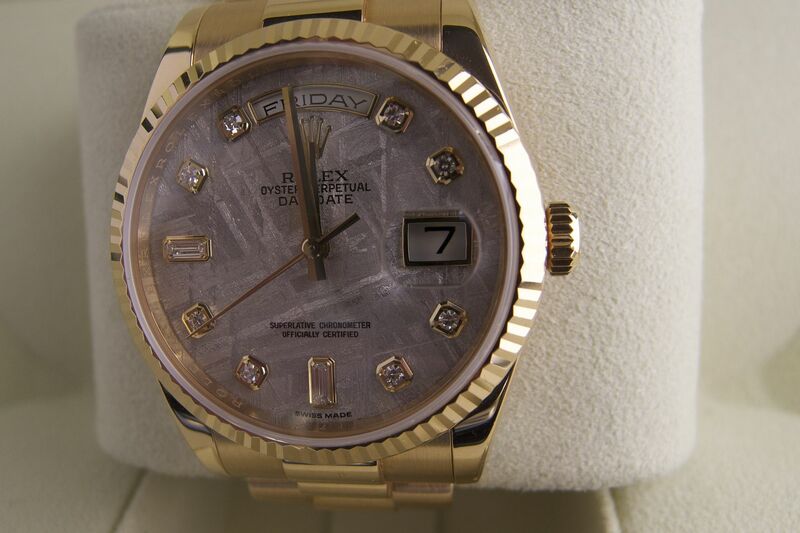 Here we have a fluted bezel on a ladies Datejust 178274 with diamond dial. Material is white gold. Fluted bezels are 18k white, yellow, or rose gold. This below is an engine- turned bezel. Material is stainless steel. The Rolex Air King has a slightly different variation of this style bezel. 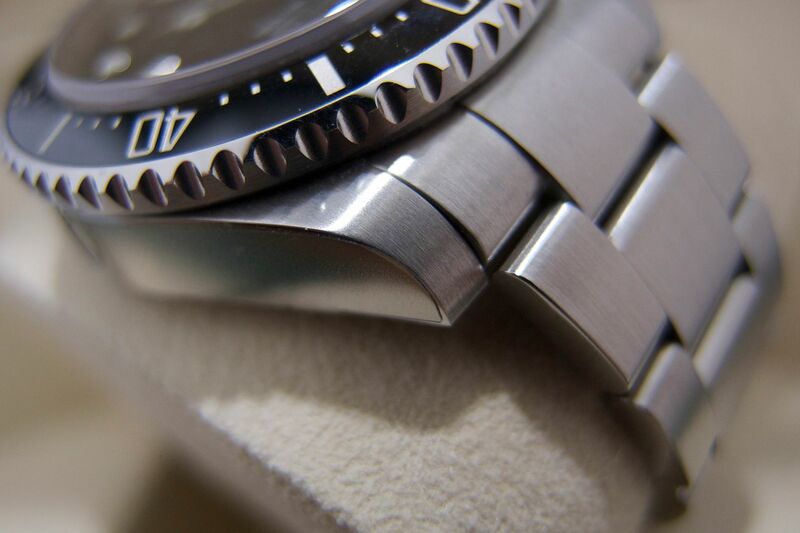 Below is a brushed bezel specifically for the Explorer II lineup. Entire bezel is brushed finished with polished edges and black painted numerals. Much less durable than a ceramic GMT Master II numeral bezel and this style is very prone to scratch and damage, especially to the brushed finish. Finally here below we have a Rolex diamond studded bezel on a ladies Rolex Datejust with Mother of Pearl dial and diamonds at the inverted “VI.” The diamonds are set on a domed stainless steel bezel. We will bring you another bezel guide (Part II) later that includes factory full diamond bezels and ruby bezels from Rolex. Rolex dial quality and night glow painting (lume) material have undergone significant changes in the last half century. Rolex dials today no longer oxidate, patina, or flake because of the extremely durable paint materials applied to the dials. However, only time will tell how the dials will react to decades of owner use. In this section we will examine some of the common dials over the years, their materials, and what the designation at the 6 o’clock position means. This below is a very early issue 7021/0 blue snowflake by Rolex Tudor, back in an era when Rolex still supplied the case components for Tudor. At the 6 o’clock position, the T Swiss T designation indicates the dial contains tritium, a radioactive material. The tritium is applied as the hour markers, and on the three hands. Tritium glows for a finite period of time, and unless a Rolex tritium dial has been relumed, it will not glow today. Here below in the picture we have a Rolex T Swiss Made T dial, which just again indicates that the dial has tritium on it. The maximum amount of tritium on a dial like this is limited to 25 millicurie. 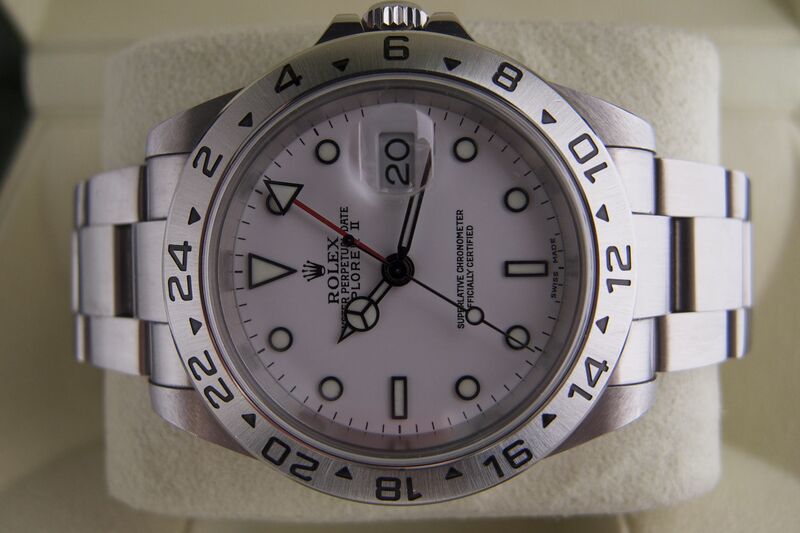 This U serial Rolex Explorer II REF 16570 below is also a tritium dial Rolex, but note the 6 o’clock designation has changed to “Swiss – T < 25." This dial design still uses tritium as the lume material for the hour markers and the hands, but the maximum amount of tritium on the dial is less than 25 millicurie as indicated by the < 25. In this particular timepiece the lume has remained white over the years, though it is very common to see eggshell yellow patina on tritium. In the dial below we have a simple “Swiss” designation at the 6 o’clock. This is the earliest designation for a modern luminova dial, and the Rolex Swiss dial contains no more radioactive tritium. Instead the dial uses luminova, a non radioactive material invented in 1993 by Nemoto & Co., Ltd. of Japan. Luminova will absorb light, both natural and artificial, and use that light to provide night lume for hours. The lume color is green. 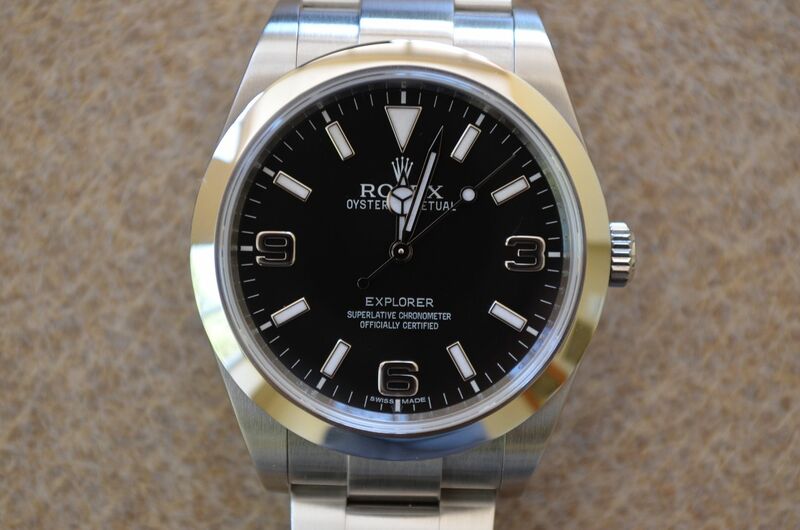 The Rolex below is another REF 16570 Explorer II, same model as the tritium model above, except with luminova. However this time it has a Rolex “Swiss Made” Dial at the 6 o’clock designation. This indicates a continuation of the luminova dial and replaced the Rolex “Swiss” dial seen previously. The lume color is again green. It is important to note that very old Rolex watches made prior to the 1960’s also had Swiss and Swiss Made designations. Those timepieces had radium as the lume source, and radium is much more damaging to health compared to the also radioactive tritium. 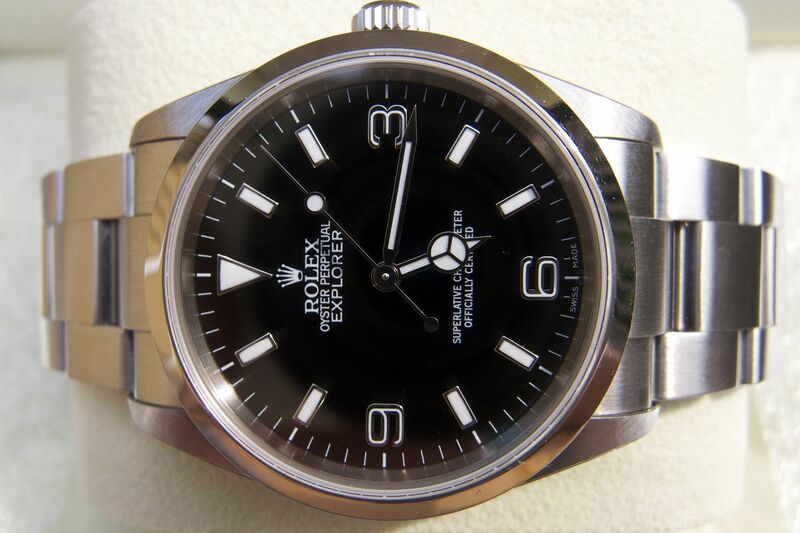 Finally, below we have a modern day year 2013 Rolex REF 214270 39mm Explorer. It also sports a Swiss Made dial with the “Swiss Made” at the 6 o’clock. However the lume material has been upgraded once again by Rolex. This time the material is called chromalight, and it glows blue instead of green like luminova. We have found this new material to be harder to charge (we use the sun or a lamp to charge the lume to see how long it lasts), however it glows noticeably longer than the green luminova it replaced. 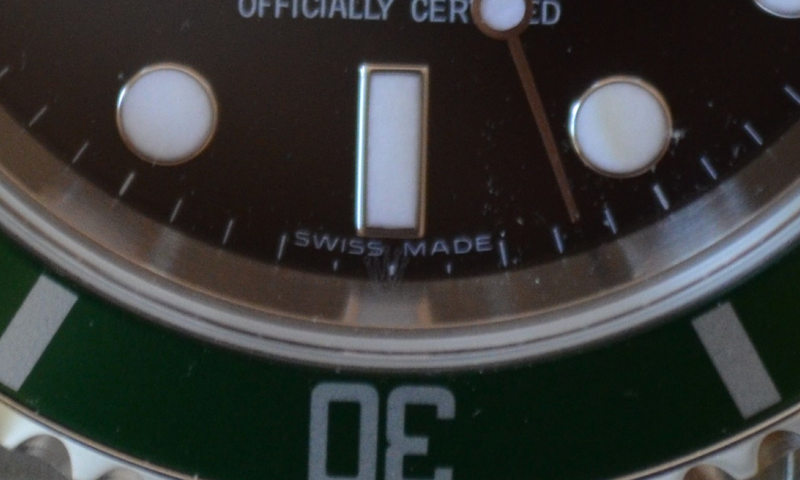 The new material had no impact on the 6 o’clock designation as it stays “Swiss Made” for Rolex models today. Below we have a beautiful 36mm Rolex Day Date 118238 with a factory meteorite dial, one with 10 factory Rolex diamonds set on the hour markers. Little do many know that the Rolex meteorite dial is sliced from an actual meteorite that landed on Earth (more on that later), and that each individual dial is distinctly unique. Rolex makes its factory meteorite dials from one unique meteorite called the Gibeon meteorite. This unique meteorite seen below landed in Africa’s Namibia in ancient prehistoric times; no one knows for sure when it landed on Earth, but radiometric dating puts the meteorite at around 4 billion years old. Yes, Rolex meteorite dials are made from an outer space rock from four billion years ago!! The Namibia natives have already known the existence of the Gibeon meteorite field, and introduced the a sample of the rock to a captain J.E. Alexander in 1838. Today the export and sales of the Gibeon meteorite have been banned by the local Namibian government, though the Gibeon is by no means a rare rock as more than 26,000 kilograms are estimated to exist. 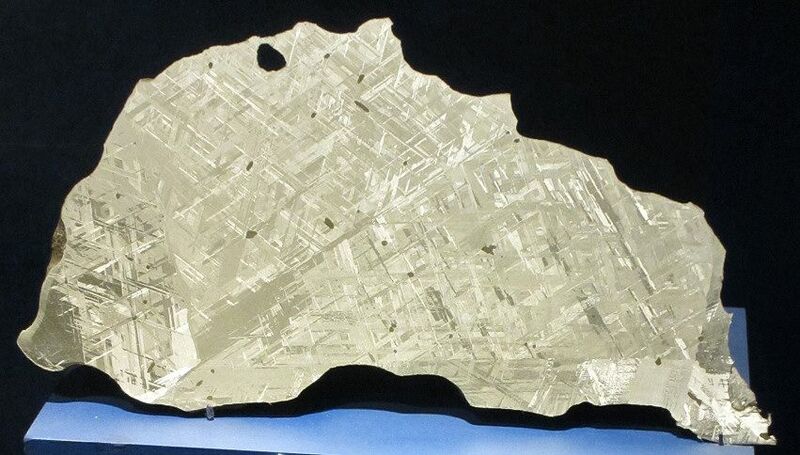 Here is an actual slice of the Gibeon meteorite. The Rolex meteorite dials can be found on precious metal models from the Day Date to the Daytona, and it’s something you just don’t see everyday even when you walk into your local authorized dealer. Imagine walking around with a piece of 4 billion year old rock on the wrist, and one can begin to fully appreciate the beauty and uniqueness of this special dial. The antiglare coating applied to watch crystals has been a Swiss timepiece industry practice for many years now. Omega among many other prominent watch houses has been applying anti reflective coating to the entire crystal, and in fact one does not need to spend thousands of dollars to find antiglare crystals. Go out and buy a $200 Citizen or Seiko, and you will likely see crystals with antiglare treatment applied. 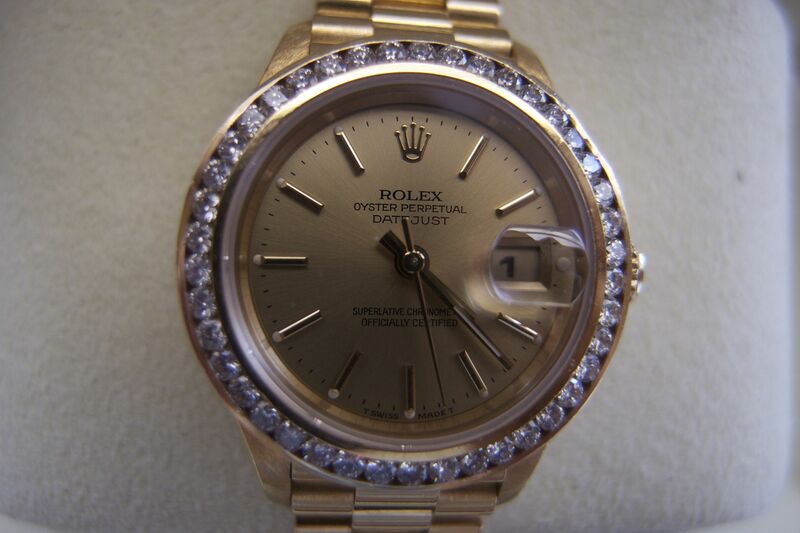 Only in the past few years has Rolex applied antiglare coating to its crystals, and only on the date models’ cyclops. 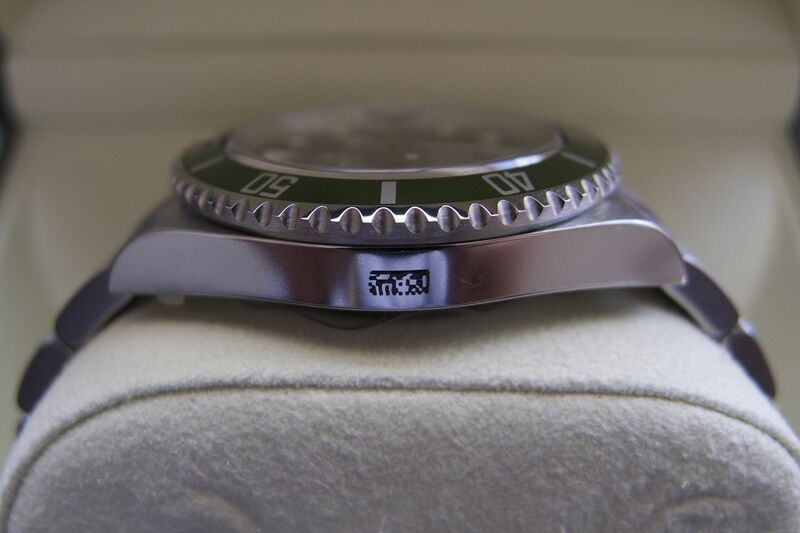 Below is a modern ceramic “Hulk” 116610V/116610LV green dial Submariner with antiglare cyclops. The antiglare coating very effectively eliminates glare and reflections, especially in strong lighting conditions. Today you will find antiglare paint applied on just about every Rolex date model’s cyclops. It is a very neat and practical feature that makes reading the date a little easier. 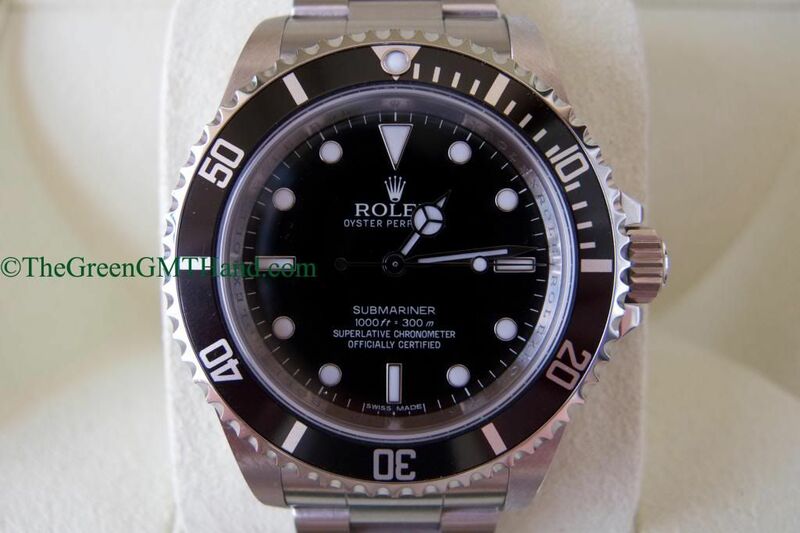 The only aluminum bezel discontinued professional series model to ever receive the antiglare cyclops is the Rolex 16610 Submariner and 16610V/16610LV 50th anniversary green Submariner. 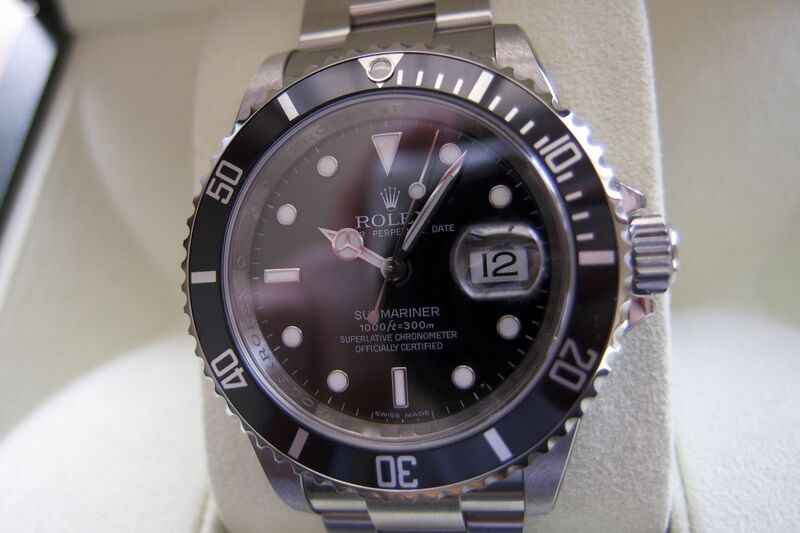 Beginning in the late V serial number in 2009, I have seen as early as V8 serials, Rolex began placing antiglare cyclop crystals on the 16610 Submariner and 50th anniversary green Sub. This practice persisted till the end of the V serial number, throughout the G serial, and onto the random/scrambled serial numbers. 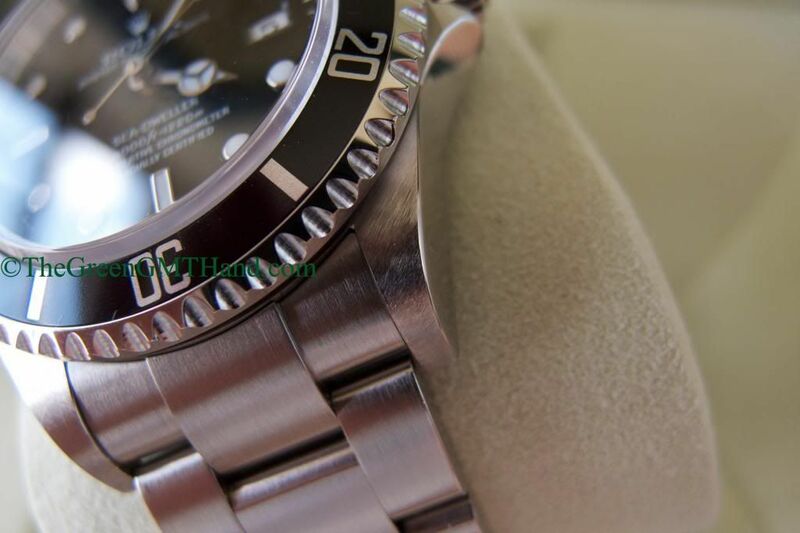 After those serial numbers and within a year, Rolex introduced the 116610 Submariner and the 16610 Submariner aluminum bezel insert issues were permanently discontinued. 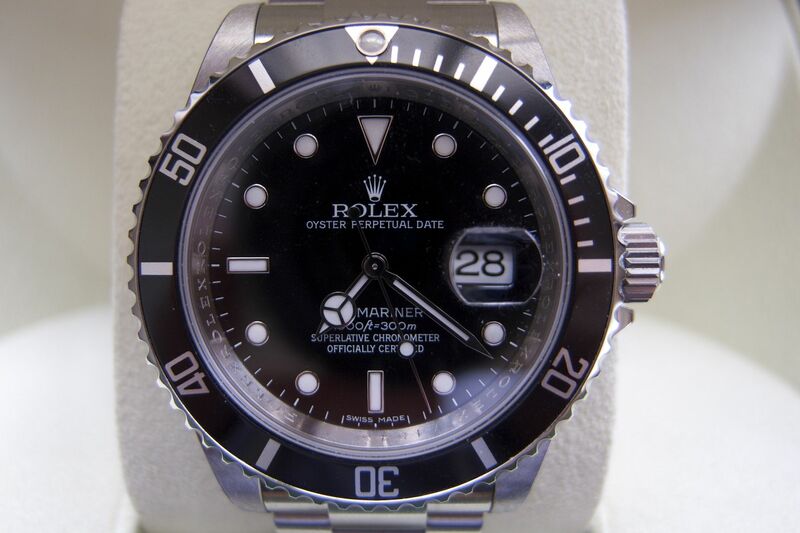 Thus it is very rare to see a Rolex 16610 Submariner and anniversary Submariner with factory antiglare cyclops. Compare the differences below between a V4 serial 16610 Submariner and a random serial counterpart, and note the lack of glare/reflection on the latter’s date cyclops. The pictures were taken at identical angles and at identical lighting conditions to demonstrate the difference. The difference is quite noticeable. Today you will find the antiglare cyclops crystal across all Rolex date models. It is good to see Rolex finally add this feature to their lineup, even if it is only to read the date. Sometimes I think Rolex likes to toy with collectors’ sanity! Over the last 50 years, there have been multiple dial variations of the same model number Submariner from serif 5513 to mark 1 to mark 2 to mark 3 5513’s and on and on. Truth is as Rolex aficionados and as many of our customers are serious collectors, we like to know every little detail that makes our timepiece unique. This uniqueness is truly one of the most wonderful things about Rolex watches. This section is on the Rolex “short feet dial” that is found on the last issues of the Rolex 14060m no date Submariner and the 16610 date Submariner. Compare the two dial images of two different Rolex no date Submariners. The first one is a M serial from 2007, with a normal dial consistent both with the non-COSC dial prior to 2006 and the COSC dial after that. 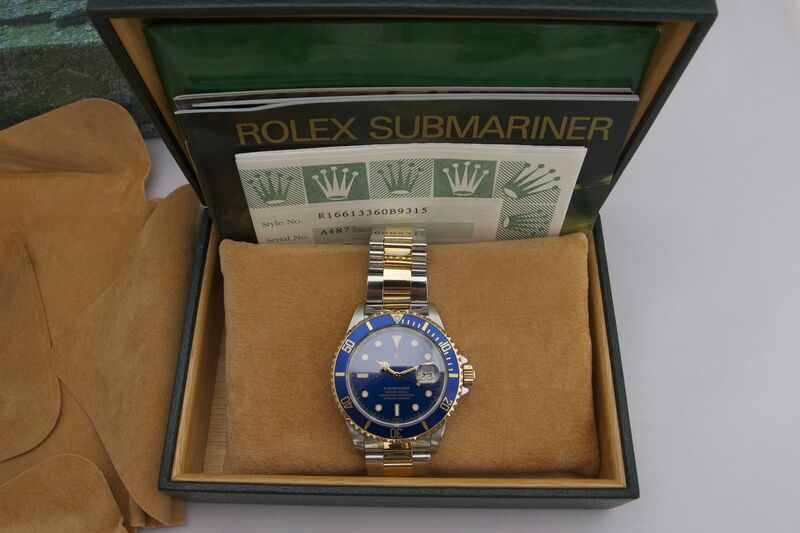 The second picture features a random serial number last issue no date 14060m Submariner, the last serial number before Rolex permanently discontinued this model. Note the way the “ft =” is written on the dial. On the normal dial in the first picture, the “ft” is different in font compared to the second picture, and the “=” in the second dial is almost difficult to see with the naked eye without a loupe. The random serial number 14060m no date Submariner sports this unique small feet dial, and we have seen it universally throughout the G and random serial number no date Submariners. The issue becomes slightly more complicated in the 16610 date Submariner. 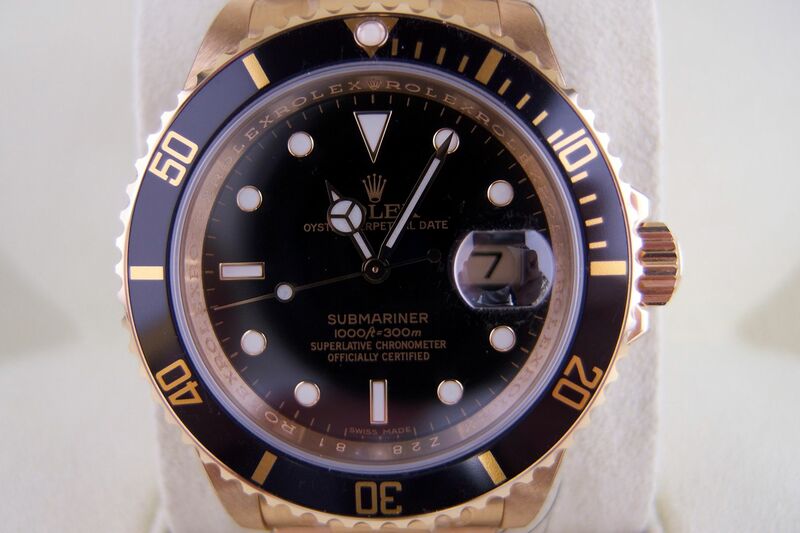 In the first dial seen below you actually have a random serial last 16610 Submariner with a standard normal dial, the same one that has been on 16610 date Submariners for two decades. Yet the second dial (a G serial produced concurrently as the first) is a short feet dial. 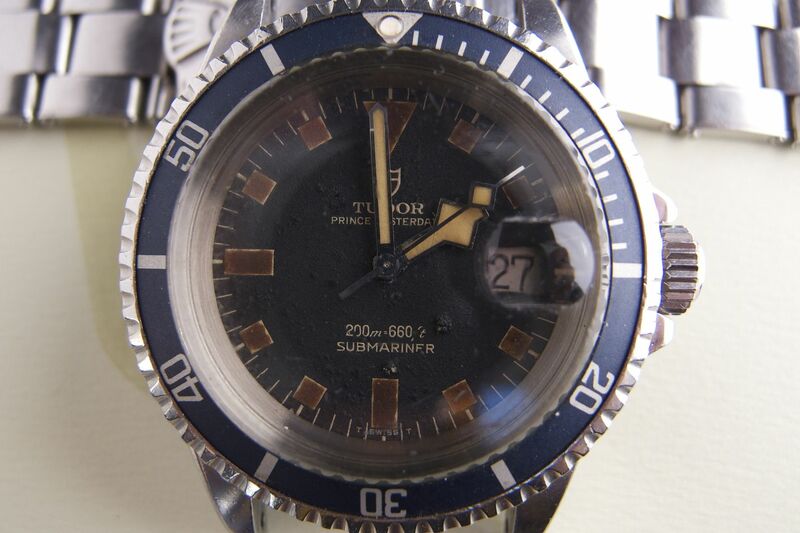 We have seen G and random serial number 16610 Submariners with both short feet and normal dials. Rolex utilizes two types of crowns on their modern wristwatches. The first is the Rolex Twinlock crown system, which is the smaller of the two crown types. The Twinlock crown is rated to be water resistant at up to 100 meters/330 feet. It utilizes two separate rubber gaskets that work in tandem to keep water and dust out. In fact, when a Rolex Twinlock crown has been properly pressure tested, no water can penetrate the crown system even if were left in the winding position (not recommended though!). You will find the Twinlock crown used on a wide range of Rolex timepieces from the Explorers to the Day Dates as seen below. The Twinlock crown is indicated by two dots or a straight line beneath the Rolex coronet on the winding crown. 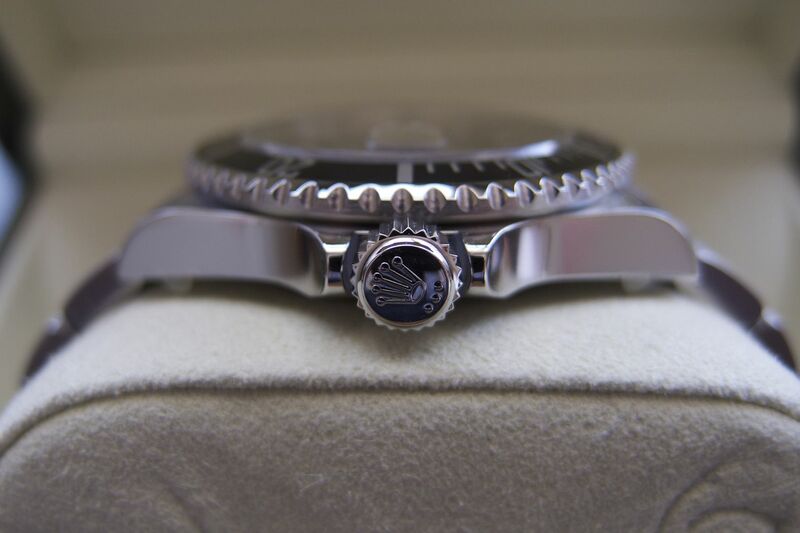 The second type of crown Rolex employs is the famed Rolex Triplock crown, which can be found on all of Rolex’s divers, the Daytona, and the GMT Master II ceramic models. The Triplock crown is physically larger than the Twinlock crown, and is water resistant up to 300 meters/1000 feet. Within the Triplock crown there are four separate rubber gaskets as opposed to the two in the Twinlock crown, and this difference is a major factor in allowing the Triplock crown to be water resistant to a deeper depth. 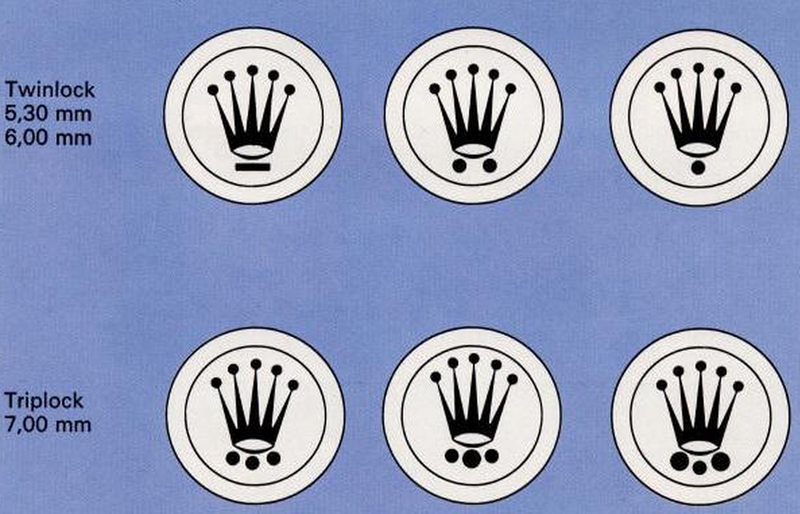 The Triplock crown is identified by three separate dots beneath the Rolex coronet on the winding crown as seen below. It is very important to pressure test your Rolex to make sure the crown and gaskets are working properly to keep the inner workings of your Rolex free from water damage and dust accumulation. Rolex has created a wonderful and effective crown system, and the rubber gaskets are very inexpensive to replace to boot. Last interesting fact on the subject of crowns: while Rolex marks the depth rating of the crowns as 330 ft for the Twinlock and 1000 ft for the Triplock, the two crowns as is the rest of the case are actually tested to depths and pressures greater than as advertised. That is the Rolex pursuit of excellence at work here! 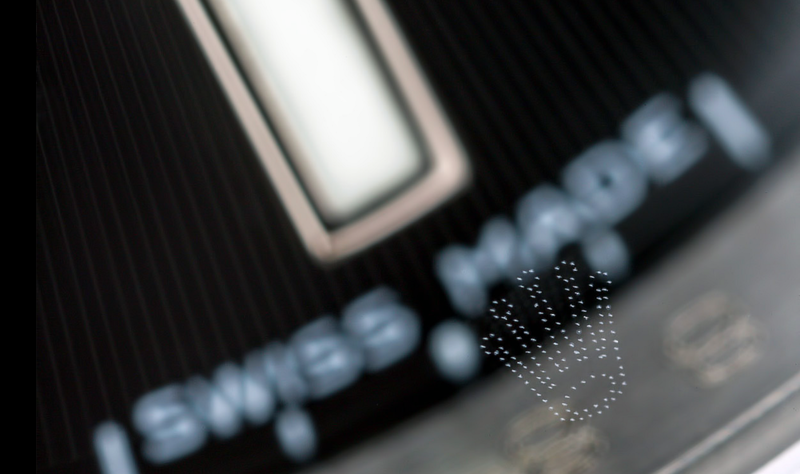 The Rolex laser etched crown feature is a small laser engraving of the Rolex coronet symbol at the 6 o’clock position of each Rolex crystal. This feature started in 2001, and was then implemented throughout the entire Rolex line including the Cellini models in 2003. The LEC is difficult to see with the naked eye, but with proper lighting and sometimes the help of a loupe can be seen quite clearly. 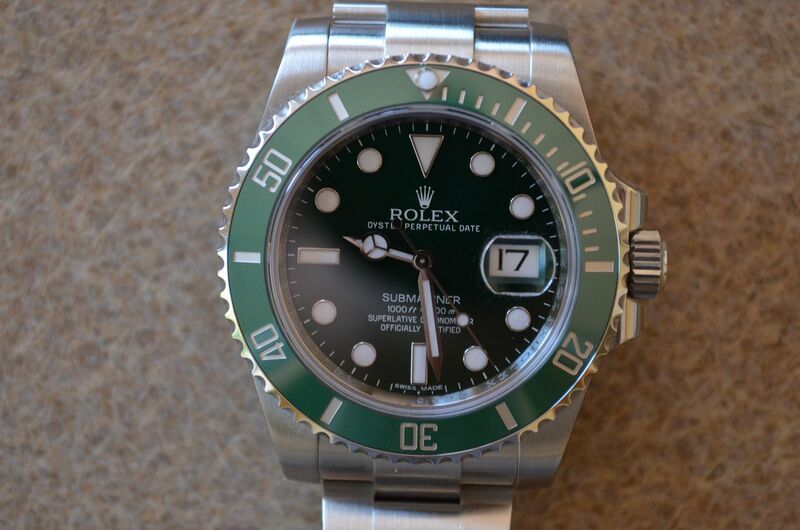 Below we have a picture of a Rolex 50th anniversary 16610LV/16610V Green Submariner. If we zoom in a bit, we can see quite clearly the Rolex coronet that is laser engraved into the crystal right at the 6 o’clock position. This different picture below shows a clearer rendition of what the LEC looks like on the crystal. 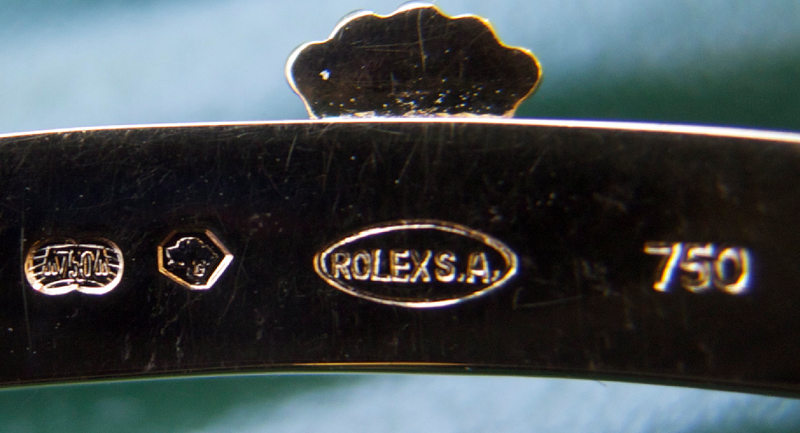 Note that if the crystal has been replaced at a Rolex service, there will be a sideways “S” engraved into the coronet at the bottom opening as seen in the second picture below. So if after reading this entry you are looking for the Rolex laser etched crown on your watch, first make sure it was manufactured after 2001. Here are some tips on how to spot it easily. Use a bright light source like the sun or a flashlight (we have found the iPhone flash to be perfect) and make sure ample light is exposed to the crystal at the 6 o’clock. Then tilt the watch to the side and try to see it from the left or right. And note that it is always easier to spot the LEC on watches with black or blue dials as opposed to white dials. 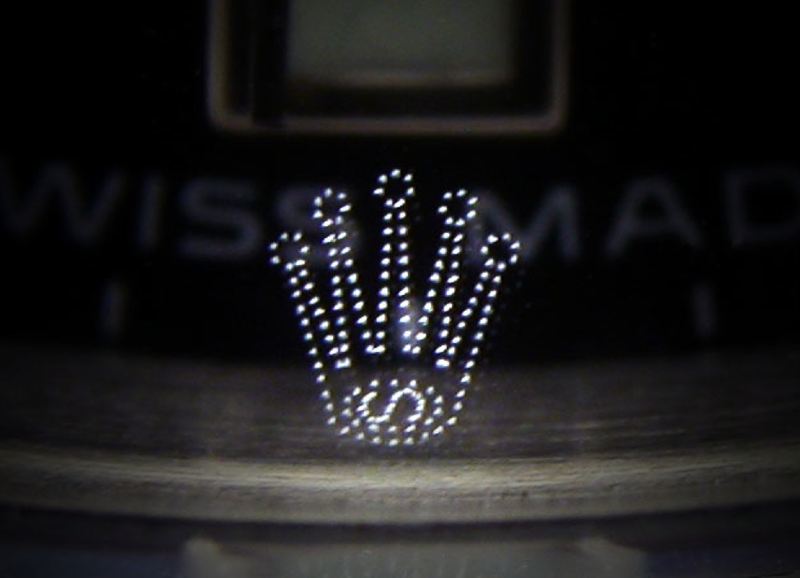 We love the Rolex laser etched crown not only because it is a neat feature but also that it is difficult for counterfeiters to replicate, as we have seen badly done attempts of overly prominent LECs. The proper Rolex LEC, like everything else on a Rolex, is just perfect. 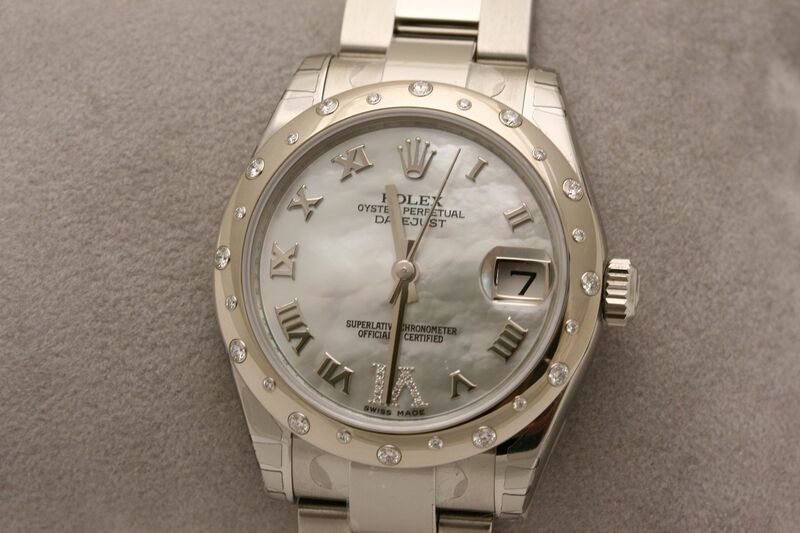 Rolex Mother of Pearl dials are beautiful and expensive additions to any Rolex timepiece for both genders. Usually a MOP dial surplus is $2000 and significantly more on solid gold models. But while these dials are mesmerizing to look at, what material do they actually come from, and what makes them so beautiful and unique? Rolex MOP dials are made from the inner shell lining of an oyster, just as seen below. When the oyster is secreting the material that eventually turns into a pearl, that material also coats the inner shell. 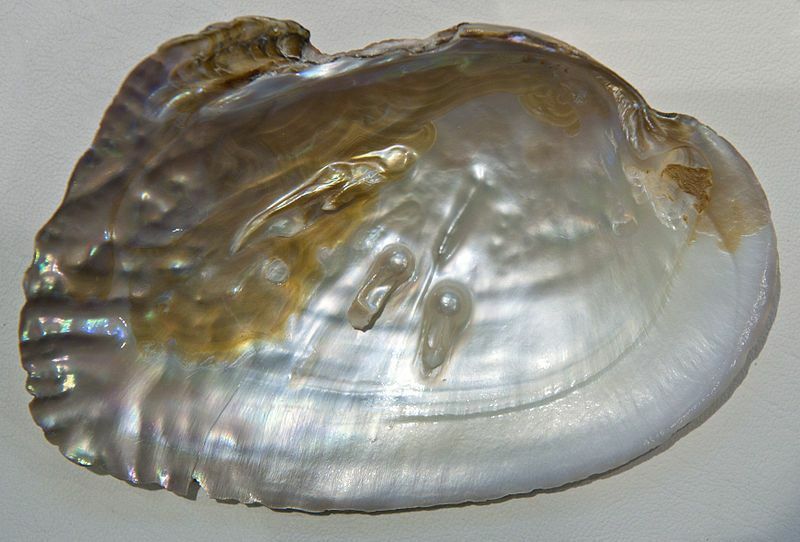 Thus mother of pearl is a literal term used to describe the encasing of the pearl inside the oyster. Mother of pearl comes in many colors, from the most desirable pink to white, black, and even yellow. Like diamonds and pearls, MOP also comes in different grades, and Rolex only uses the best and finest grade MOP for its dials. 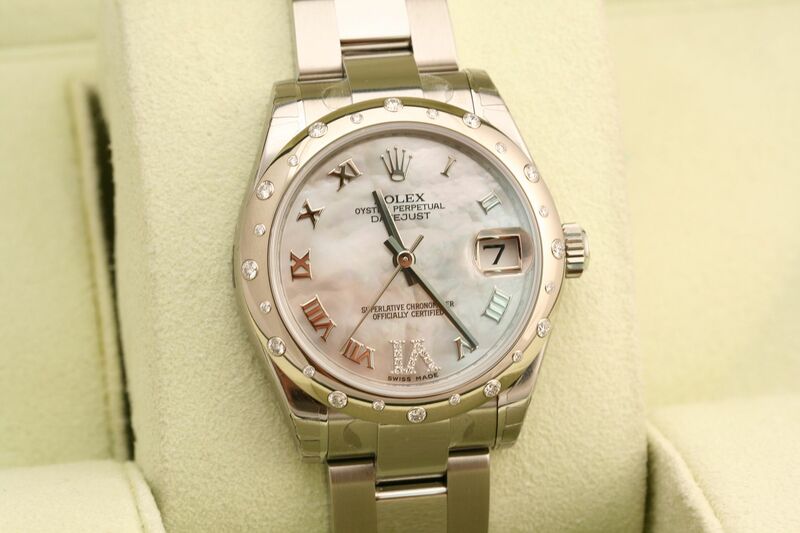 Rolex Mother of Pearl dials are never dyed artificially, and this natural substance will not change or fade with time. No two mother of pearl dials are alike, a feature similar to the meteorite dials we wrote about. Thus each Rolex MOP dial is uniquely beautiful, never to be replicated. 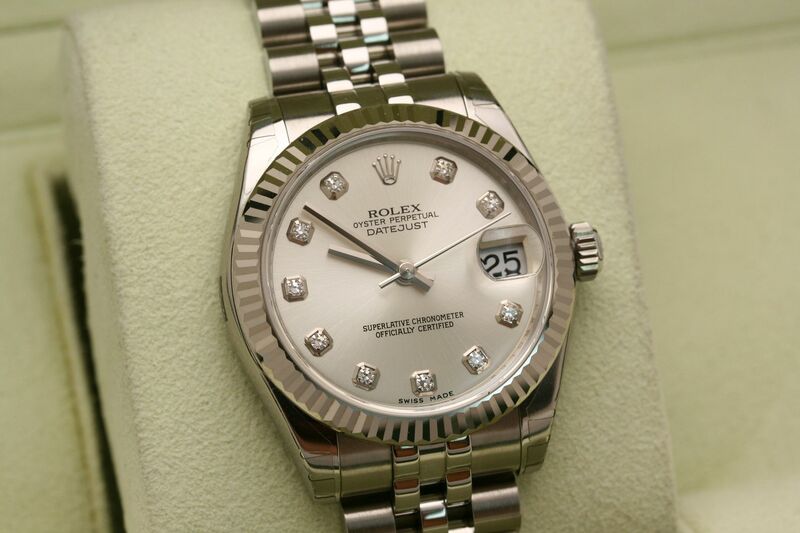 Below is a ladies 31mm modern Datejust with light colored factory Rolex MOP dial and diamonds at the six o’clock. Below we have a different shade of MOP dial, a dial Rolex calls Tahitian Mother of Pearl, and one that is significantly darker in color. 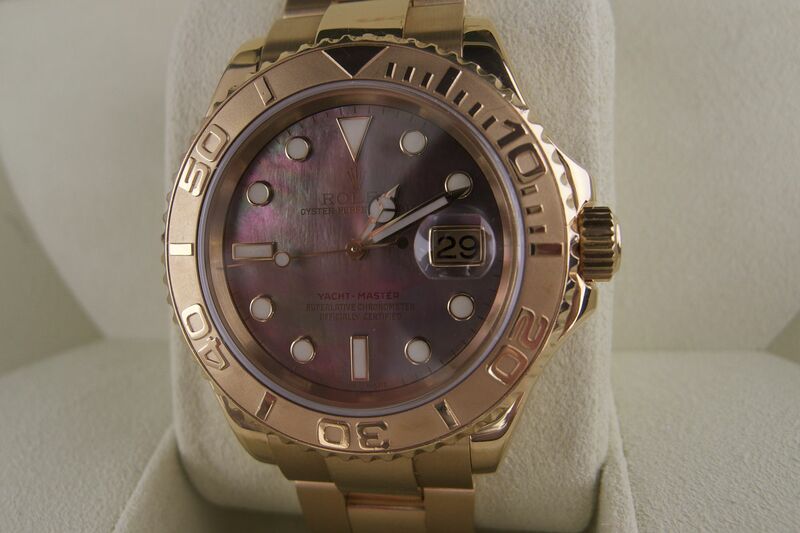 Simply put, it is one of the most beautiful Rolex dials we have ever seen, with a shade of pink clearly seen here. If beauty alone does not account for the high cost of the dials, then cost of production must be factored in. Like meteorite dials, MOP dials are difficult to manufacture to slice the raw material into fine thin pieces suitable for dial making by Rolex’s stringent standards. We imagine for every dial that passes the Rolex standard, a couple of dials are either destroyed in the manufacturing process or simply does not pass the bar, thus adding to the cost. Nonetheless, we love the Rolex Mother of Pearl dials as they represent one of nature’s most beautiful and organic gifts to us! You will often hear the phrase “SEL bracelet” used by Rolex collectors and sellers/buyers alike to describe the bracelet on a particular Rolex watch. So exactly what is SEL and why is it a selling point that sometimes pushes the price up? SEL stands for solid end link. In the picture below, take a look at the link that connects the bracelet to the head of the watch. That is the end link of the Rolex Sea Dweller pictured. The middle part of this end link is milled out of a single piece of steel. That is a solid end link bracelet. Here below is another look from a different angle of a Rolex Submariner with SEL bracelet. SEL bracelets are generally less prone to stretch compared to the non SEL bracelets, and rattle less. It has an overall more rigid feel. As of today all Rolex professional models have SEL bracelets, with the last non SEL model the Rolex 14060m no date Submariner having been discontinued in 2012. For comparison below is a Rolex 14060m no date Submariner with the non SEL 93150 diver’s bracelet. If you look at the end link and in particular the middle of the end link, you can see that it is made of two separate components as opposed to the single piece of steel in a SEL bracelet endlink. Today not only are all Rolex professional models equipped with solid end link SEL bracelets, they now all have solid middle links throughout the entire bracelet, on every single link. Those middle links were hollow before. This changes makes the bracelet significantly heavier. You will find many Rolex purists who swear by the older bracelets, and bemoan the discontinue of the non SEL 93150 in the last Rolex 14060m. Perhaps one day Rolex will bring it back, only time will tell. The Rolex ceramic two tone steel and yellow gold 116613 Submariner was introduced in 2009 at Switzerland’s Baselworld show, replacing the long lived 16613 Submariner that had existed for decades with the aluminum bezel insert. In 2013, Rolex changed the color of the 116613 dial into what Rolex collectors and enthusiasts call the “sunburst” blue. Below we have a photo comparison of the original 2009-2013 edition of the 116613 Submariner, and on the right side is the newest 2013 sunburst blue dial. 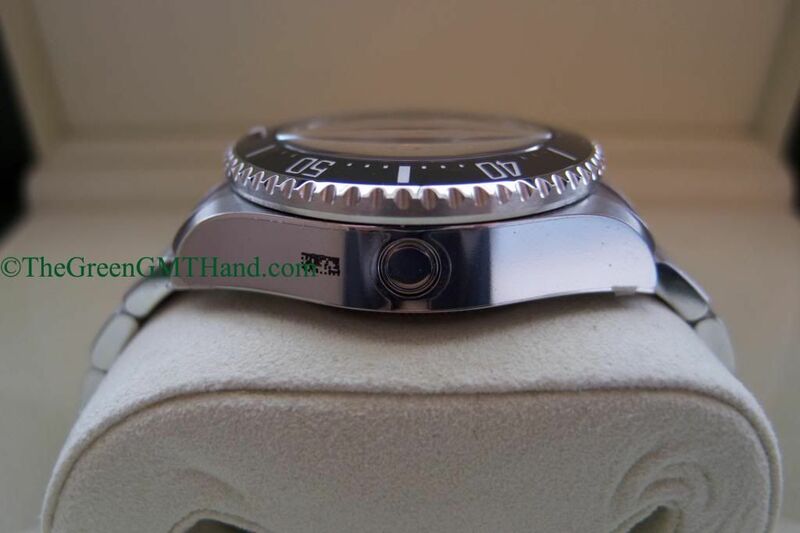 Note that the ceramic blue bezel color remains unchanged, only the dial color changed. As many collectors have noted, Rolex’s new sunburst blue color for the 116613, which remains unchanged in every other facet, is a reversal back to the original blue color on the discontinued 16613 Submariner. Note below the new sunburst blue dial of the 116613 compared to the blue dial of the discontinued 16613 two tone Submariner. The colors of the two dials are much more in unison after the 2013 update. This color change has been a very welcomed change in the Rolex buyer community. As the new sunburst blue dial pays homage to the original 16613, it is not too late to grab an original 116613 with the older blue dial, one that was only produced for 4 years. Going forward, we would not be surprised to see the price of the original blue 116613 rise drastically. The permanent discontinue of the Rolex 16710 GMT Master II in year 2007 ended the long era of Rolex bi-color bezel inserts. Dating back to the earliest bakelite Rolex bi-color inserts many decades ago, for the first time in 2007 all Rolex inserts were single colored. The introduction of the ceramic bezel insert on professional models began with the GMT Master II line, first the 116718 solid gold, then 116713 two tone, then finally the 116710 stainless steel. The Rolex collector community wondered since 2007 when Rolex would introduce bi-colored ceramic inserts, perhaps even a ceramic “Pepsi” or “Coke” much like the original aluminum ones. It was rumored that Rolex ran into production difficulties with making the ceramic bezel inserts, that certain colors were difficult to produce, and that the colors would bleed into each other on the insert itself. All the rumors were put to rest and anticipations to fruition at the 2013 Baselworld show when Rolex introduced the 116710B stainless steel GMT Master II with bi-colored black and blue ceramic bezel insert. See below for a photo comparison of the original 116710 black GMT Master II, and the newest black and blue bezel 116710BLNR. Both models are now in production concurrently, with the MSRP of the black and blue slightly higher at $8,950. Now that the bi-color ceramic bezels are here, Rolex is not letting up. At the 2014 Baselworld show, Rolex introduced the newest and first ever white gold GMT Master II model the REF 116719BLRO with “Pepsi” blue and red bezel. We will be bringing you pictures and comparison shots of this new and anticipated model as soon as it arrives in USA authorized dealers. We think the 50th anniversary Rolex 16610V/16610LV Submariner is the red sub of this generation, but that’s just our opinion. 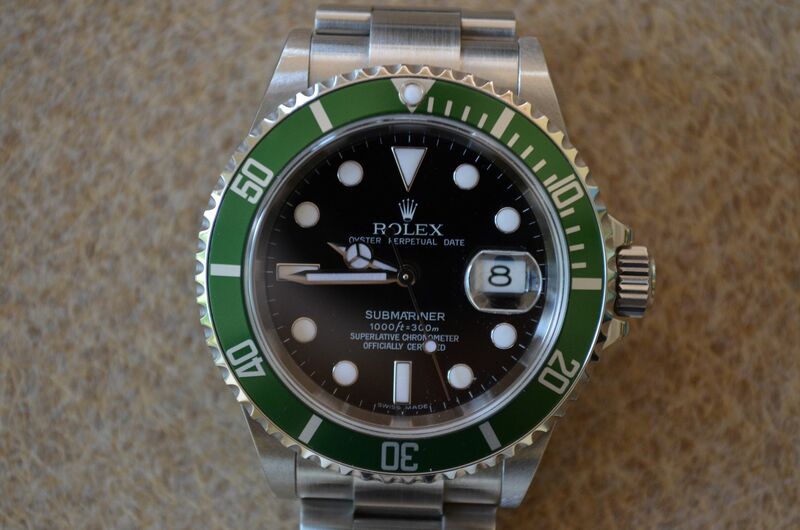 It was discontinued in 2010 in favor of the new 116610LV ceramic green dial green bezel “Hulk” Submariner as Rolex gradually transitioned its diver lineup from using aluminum to ceramic inserts. Here are a few of the changes and differences between the two models. The dial has obviously changed from black to green, but the hour markers and all three hands remain maxi hands. The bezel insert remains green, but the material has changed from aluminum to ceramic, with the latter having carved and platinum dusted markers. 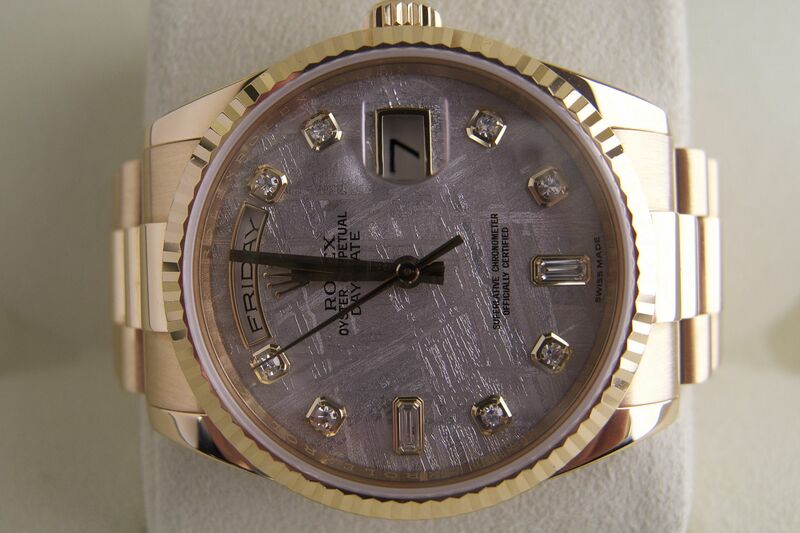 The rehault remains engraved with “Rolex” and the serial number at the 6 o’clock position. 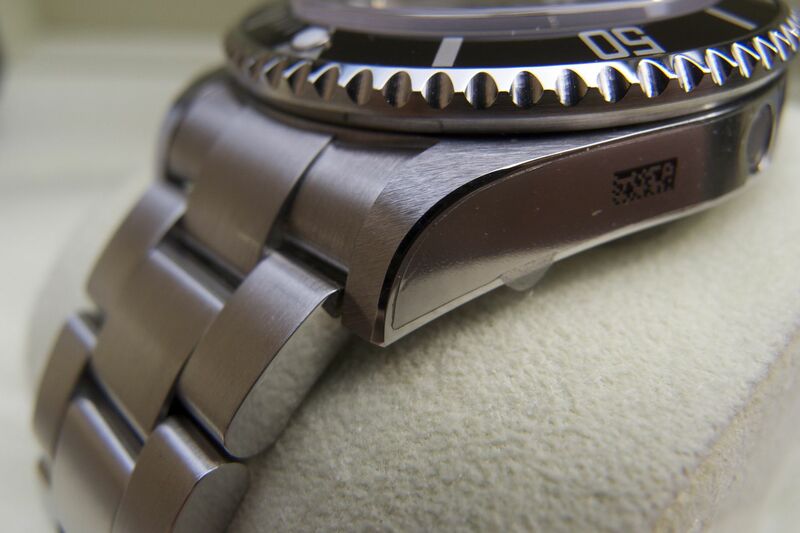 The case lugs of the newer 116610LV are fatter than the previously more tapered lugs of the 16610LV. While the movement calibre number remains 3135 date automatic, Rolex added the blue parachrom hairspring to the 116610LV movement, but elected not to change the calibre number designation. The bracelet changed drastically. First the reference number of the bracelet changed from 93250 to 97200. All middle links are solid in the newer 116610LV, whereas they were hollow in the 16610LV. As a result, the Hulk Submariner is much heavier on the wrist. As seen above, the clasp changed quite noticeably, with the newer 97200 clasp being much more hefty and solid, and thicker. The 93250 micro adjustment system consisted of individual holes on the side of the clasp, and a button released diver extension inside the clasp. The 97200 clasp has no holes for micro adjustment, and no button on link for releasing a diver suit extension. Instead the 97200 bracelet clasp houses a glidelock adjustment system patented by Rolex for instant adjustment. On the right above is the newer 97200 bracelet clasp for the 116610LV. On the left above is the older 93250 bracelet clasp for the discontinued 16610LV anniversary. Both are SEL bracelets. Two beautiful watches, take your pick and put one on your wrist, we promise you will not regret it! 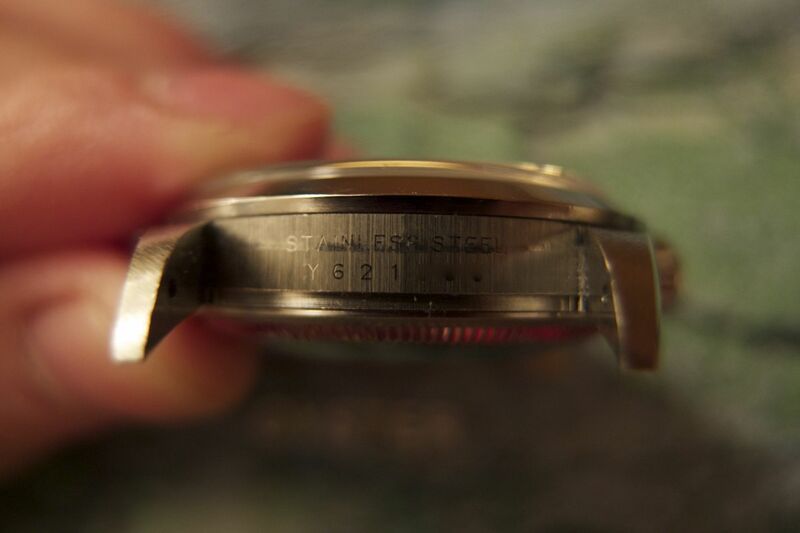 On many older Rolex timepieces with their original warranty certificates, you will find red letters on the back side as seen in the picture below. These letters may seem completely random, but they served a purpose. 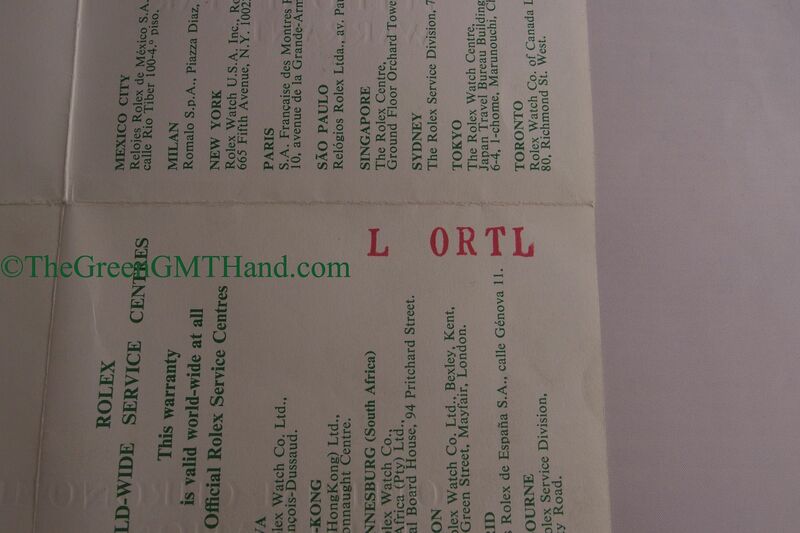 Using this chart and this information, the seemingly random “L ORTL” becomes “3 2183.” This signifies that the watch was shipped by Rolex to the authorized dealer on March 21st, 1983. 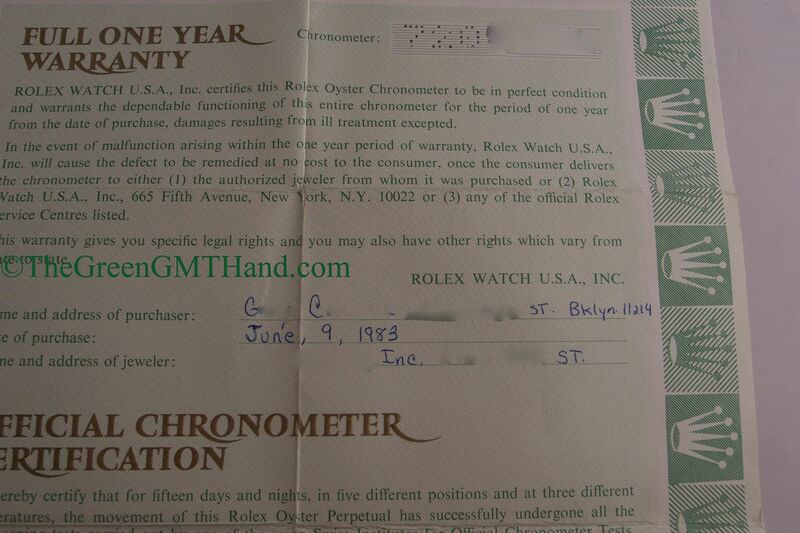 When we flip to the front of the warranty certificate as seen in the picture below, we can clearly see that the customer purchased the said timepiece on June 9th, 1983, merely a little more than two months after its arrival to the authorized dealer showcase. The red letters can be found on USA warranty certificates, and using the chart above, you can decipher when your timepiece was shipped from Rolex to the authorized dealer. The seemingly random numbers served a very practical purpose for the Rolex distribution process. Mystery solved! We often get many questions about the actual differences between the green 50th anniversary 16610LV/16610V and its 16610 black Submariner sibling. Both were permanently discontinued in 2010. Fortunately, all the differences between the two models are cosmetic, and enough to justify the $300 premium for the green LV when it was last produced in 2010. Both models use the same Rolex caliber 3135 date movement, without parachrom hairspring. Both received the rehault engraving at around the same time in 2006/2007. Below are 3 sets of 16610 Submariners from different eras. In the last comparison we have the last variant of the two 16610 models before they were discontinued in 2010. It differs from the second comparison in that Rolex has added the engraved rehault, with “Rolex” engraved all around the inner dial wall, and the serial number engraved at the 6 o’clock position. The two watches once again only differ in dial, with the LV having the maxi dial. 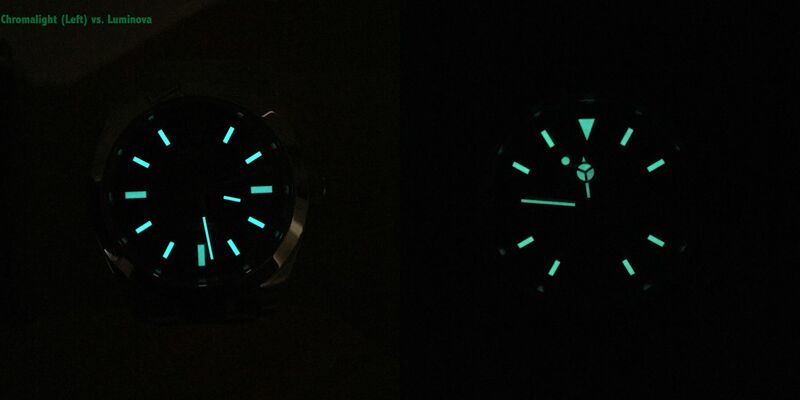 Even the lume material used on the two dials is the same: green luminova. If you take off the bracelet on both watches, at the 6 o’clock you will find the unique serial numbers. But at the 12 o’clock position, you will find the same “16610T” engraved in both 16610 black and 16610LV models without lug holes. The “T” stands for without lugholes. Thus there is no way to distinguish the two watches by just looking at the case alone, you would have to refer to the paperwork and look for “16610V” or “16610LV” on the warranty certificate/card and the green serial number tag. 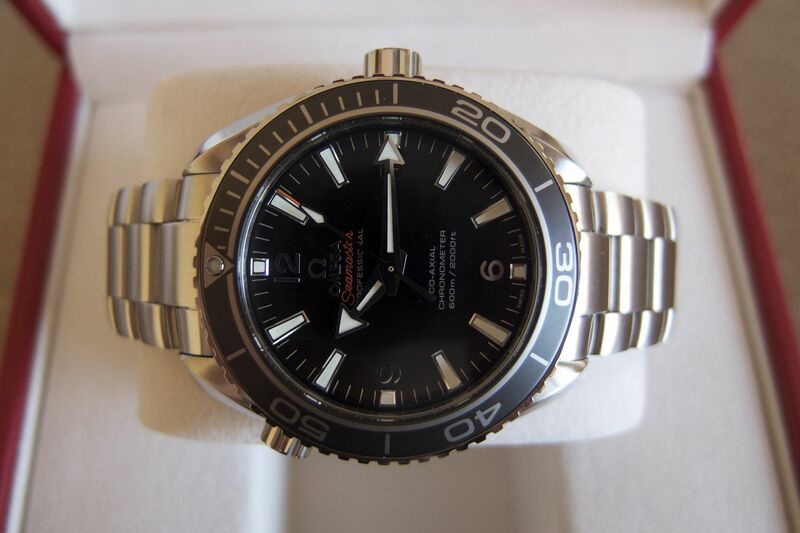 Earlier 16610 black models with lug holes were stamped “16610” instead of “16610T” at the 12 o’clock, and since the LV never had lug holes, if you find one with “16610” stamped then it is either not genuine or the case was swapped. Lastly, the 93250 bracelet used on both models is exactly the same. The 16610LV has always had SEL bracelet because by 2003 when it was introduced, the 16610 black was already using the upgraded SEL bracelet. There is no visual or functional differences between the two in any way. They use the same fliplock clasp and the same microadjustment system with a hidden diver’s extension inside the clasp. Many of our customers are surprised to know that the discontinued 16613 two tone and 16618 18k yellow gold Submariner models actually carried 2 different serti dial options. We are accustomed to the standard black on the 16610 and 16610LV Submariners, the black and green on the 116610 and 116610V ceramic Submariners, and the black and blue on the 16613 and 16618 Submariners. But on top of the regular black and blue dials, you could find, albeit in very small numbers, two variants of factory serti dials decorated with diamonds and blue sapphires. As seen above, on the left is the silver serti dial and on the right is the factory champagne dial. 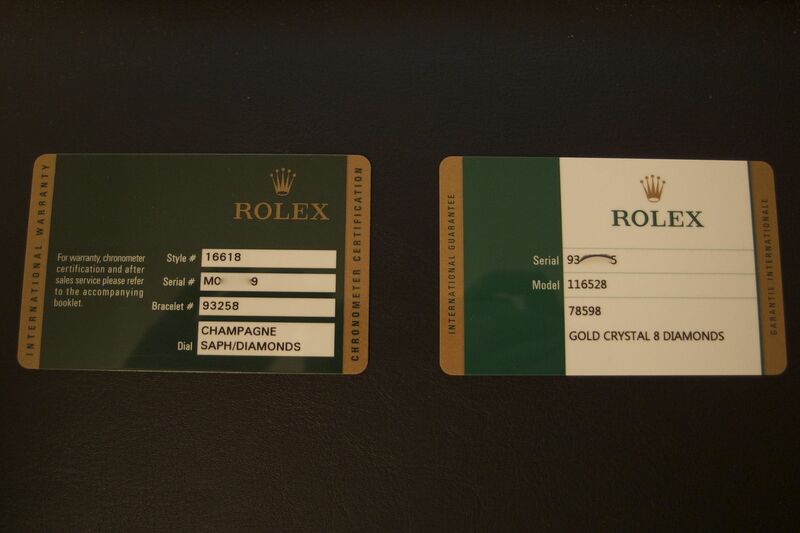 The warranty card will also indicate which variant was installed at the Rolex factory. Both dials are identical except in color, having 8 diamonds and 3 blue sapphires at the hour markers. You will be hard pressed to find a 16613 or 16618 with serti dial in the wild. We think they are both equally beautiful! The Rolex transition to maxi dials directly affected the Explorer II, GMT Master II, and Submariner models in the past 5 years. The Submariner is the only sport model of the three to offer a diamond dial for the two tone and solid gold models. Note the changes below from the older diamond serti dial to the new “maxi” diamond dial. Among other differences, the diamonds clearly are much larger on the newest ceramic models. The larger diamonds only partially contribute to the $16,800 price tag on the new 116613 serti and nearly 40k price tag on the 116618/116619 gold Submariners with diamond dials. The additional amount of gold needed to mill the larger case and the heavier bracelet/clasp is an additional reason for the more than 50% price hike. Nonetheless, both the new and old diamond dials are mesmerizing, and if budge permits, we invite you to seriously consider these dial options on your hunt for the next Rolex. 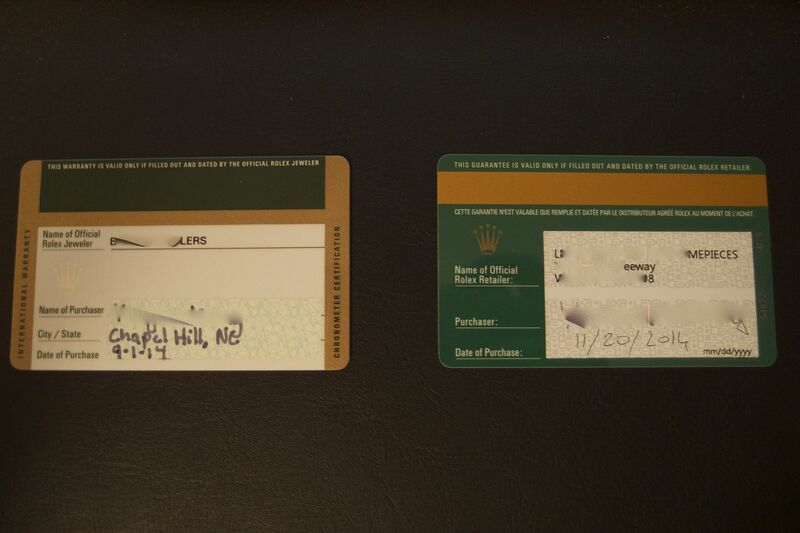 In 2013, Rolex updated their warranty card that has been used since 2006. It also updated the entire range of boxes, and we will do a separate post on that later. Seen below, the front of the old and new warranty cards present the same information: model number, bracelet number, serial number, and dial. We have blurred out the serial numbers. On the back is where we find significant changes. Note that we have blurred out the purchaser’s name and the authorized dealer’s name. The buyer’s name and location are still hand filled into the back of the card, but at the top of the new card there has been added a magnetic strip. From our understanding, this new magnetic strip is added to ensure warranty integrity. 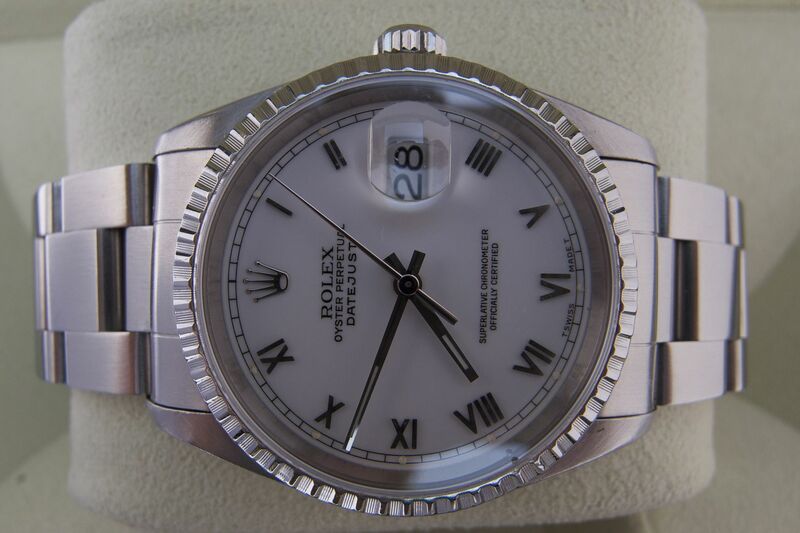 The authorized dealer runs the card through a machine that links to the Rolex database whenever the watch is purchased new from the dealer. The two year warranty takes effect from that day onwards. Here is a closer look at the magnetic strip. It looks just like a credit card’s. Lastly, there is a unique addition identifier number at the right bottom corner of the new warranty card. We have partially blurred it out. 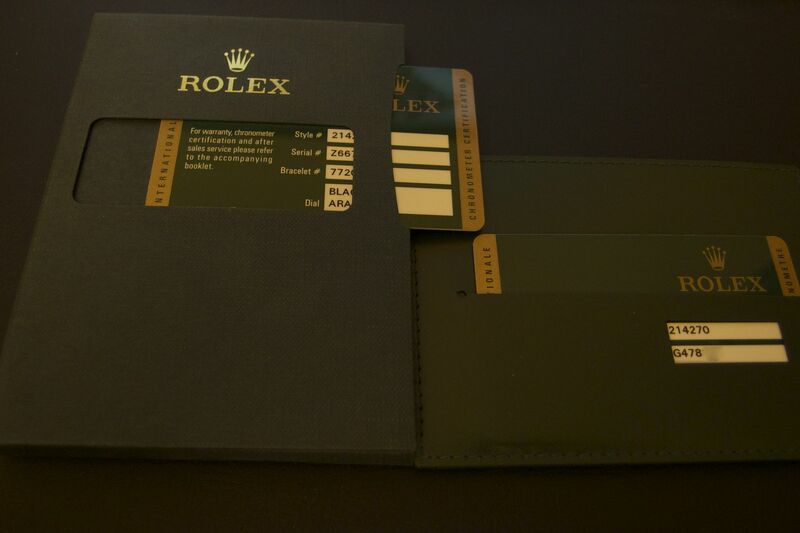 This new style warranty card took effect in 2013, and is now uniformly used on all Rolex models including the Cellini lineup. Both USA and overseas authorized dealers use the same warranty card. Many customers often ask us the difference between a matte and a gloss dial. Technically there are 3 different kinds of Rolex dials. Radium dial was first used by Rolex, then discontinued in 1960 when radium was found to be the likely cause of cancer and birth defects for many watch factory employees. Then came the matte tritium dials. Below on the left is a matte dial. The tritium is directly applied to the dial as hour markers and onto the hands, and there is no surrounding material on the hour markers. They are essentially individual paint blobs. The tritium would glow in the dark for some years, and eventually stop glowing. Matte dials do not need the sun or any light source to glow, and if you find a matte dial today, unless it has been relumed (not recommended), it will not glow. On the right is a later period Submariner with gloss dial. The gloss dial on this watch also uses tritium, but the hour markers are enclosed by a white gold surround. You can notice that the hour markers are significantly smaller on the gloss dial when compared to the matte dial, which we consider to be the original “maxi dial” found on the Submariners, Explorer II’s, and GMT Master II’s today. 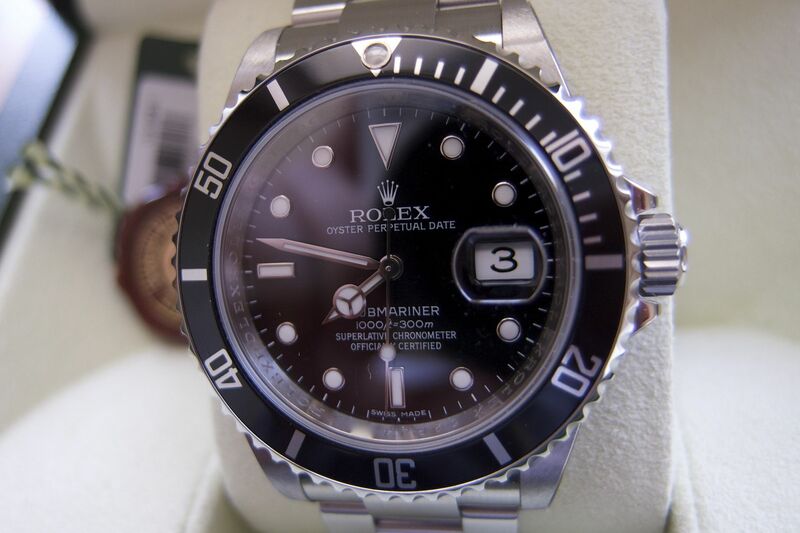 Generally, matte dial sport models such as the Submariner and GMT Master command premiums, sometimes significant, over the gloss dial models. The more original the better. 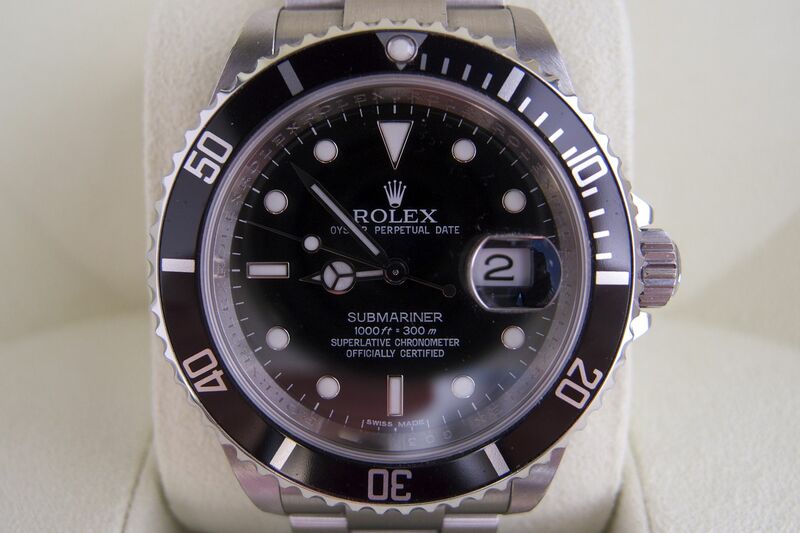 A matte dial Submariner with matte hands is considered more original than a similar matte dial Submariner with later replacement gloss hands likely added at service. For reference, the last Explorer model with matte dial is the 1655 Steve Mcqueen orange hand Explorer II, the last Submariner with matte dial is the model 16800 seen above left, and the last Sea Dweller with matte dial is the model 16660, also known as the “Triple Six.” The transition to gloss occurred in the middle of the 16800 and 16660 issue, signaling the permanent end of matte dials on Rolex watches. Another question we often field is “what is an open six and open nine” date wheel? See below for examples of open (discontinued) and closed (current) six and nine date wheels. The open six date disk is just as the name suggests: the last stroke of the black ink on the date wheel anytime a “6” or “9” appears does not close to touch. The six and nine are open so to speak. This was discontinued in the late 1980’s by Rolex, and current model Rolex watches all have closed date wheels as seen above on two current popular models. This is just another feature some collectors desire on their vintage timepieces. Generally most date model Submariners REF 16800 and before all have this, unless the date wheel was swapped at service, not a common practice. We hope this helps you in your quest for the perfect vintage Rolex timepiece. 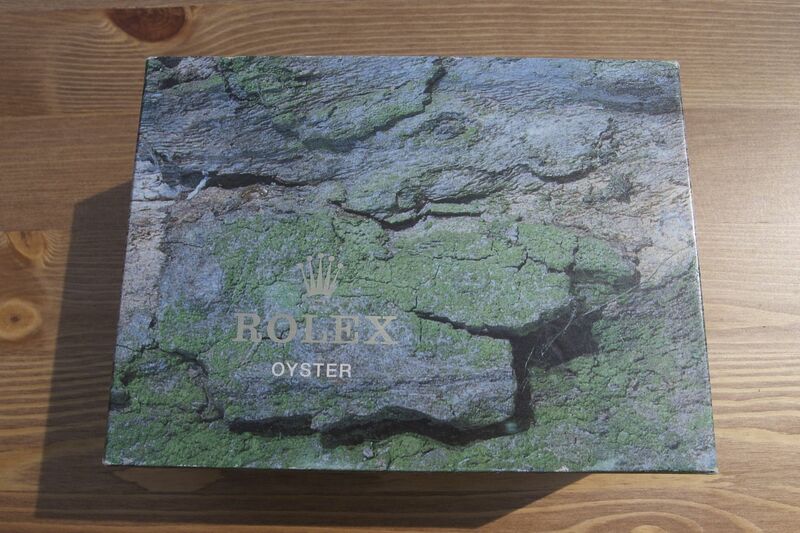 In late 2013, Rolex updated its box styles along with the warranty cards. The new boxes received some small cosmetic changes. See below for the color change of new vs. old box styles. 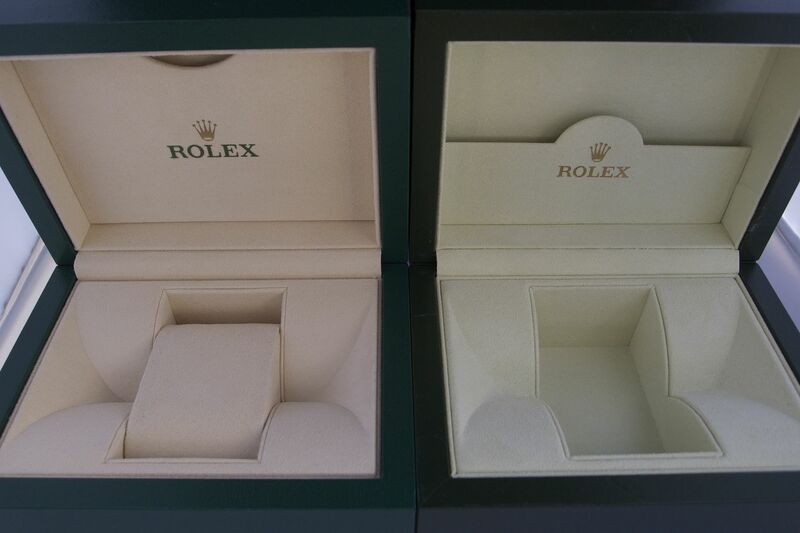 On the left is the newest style Rolex box. The box sizes are still the same as before. You can see the color has changed both inside and outside the box. One useful feature of the new box is the advantage of a larger pocket inside the box that can actually be opened and closed. This is neat for storing your tags, extra links, and warranty card. See below. Overall a very nice and subtle update by Rolex, one that makes its boxes even more functional. Rolex has never been known for ornate boxes. Audemars and Patek are two brands with notably large and elegant wood grain boxes. We find the Rolex boxes to be perfectly functional and sturdy. After all, you wear the watch, not the box. One of the most welcomed changes/upgrades Rolex has made across its Submariner/GMT Master II/Explorer lineup is the sturdier clasp. The old clasps, while functional, were essentially thin sheet metals. New Rolex clasps in the sport models utilize two uniquely simple yet effective ways to adjust the clasp. Note below the newest glidelock adjustment system compared to the older 93250 bracelet diver’s extension. The adjustment system is built into the clasp itself on the glidelock, and offers much more adjustability compared to the previous push down diver’s extension on the REF 93250. As a result, the microadjustment holes on the previous clasp are now obsolete as seen below. The new glidelock clasp completely takes care of adjusting for warm or cold weather wrist expansion or contraction, as well as when divers need to wear their Submariners or Deep Seas over a dive suit. The current Explorer, Explorer II, GMT Master II, Milgauss, and Datejust models also feature sturdier and heavier clasps, which have all eliminated the need for microadjustment holes. See below for a new Rolex 214270 Explorer clasp compared to an older Rolex 114270 Explorer clasp. Notice on the left side the new clasp still allows 3 microadjustment positions, drilled lightly (not through) into the inside of the clasp to create a slot. The previous clasp on the right offered a total of 6 microadjustment hole positions. This is when the new Rolex easy link system comes in. See below. The easy link system found on the new clasps is a convenient way to quickly extend or tighten the bracelet. This feature is perfect for warm/cold weather situations when the wrist expands or contracts ever slightly. The system is extreme simple to use; it is a quick closing and snapping of the “easy” link. We find the new Rolex clasps to be a tremendous step forward. Our customers have responded very positively to the new clasps despite the added weight. These clasps retain the traditional Rolex practical functions, all the while becoming more solid and well built. Rolex timepieces come in different styles, metals, and sizes. They also come with different types of bracelets and straps; sometimes even the same model can be equipped with two different types of bracelet. For example, the 116200 Datejust today comes on either an oyster bracelet or a jubilee bracelet. There are currently two types of oyster bracelets, seen below. The first kind is an all brushed oyster bracelet, which features an also brushed clasp. The second is called the “PCL” oyster bracelet (PCL= Polished Center Links). The stainless PCL oyster bracelets first arrived on Daytonas and Yachtmasters in the late 90’s, and now they can be found on many sport models including the Milgauss and GMT Master II. 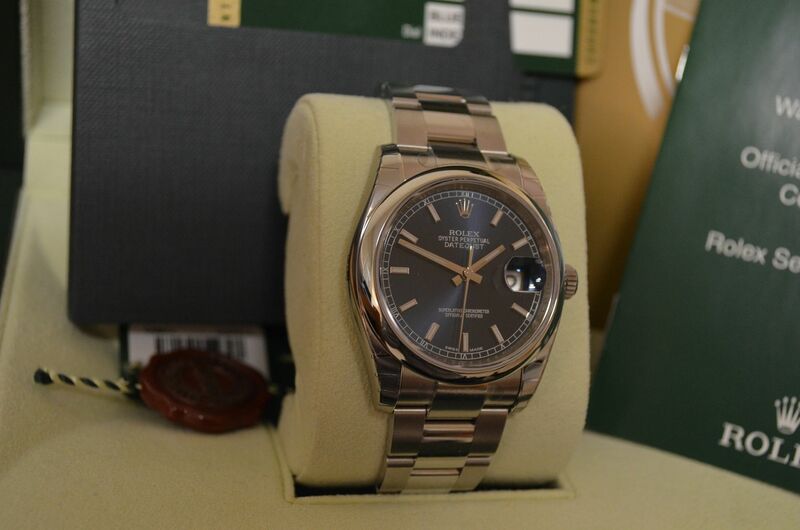 Furthermore we have the jubilee bracelet as seen below on a 116233 two tone Datejust. The Jubilee bracelet has been around for decades, and is one of the most copied Rolex designs by the entire watch industry. It is comfortable, classy, and now sturdier after Rolex replaced the hollow center links with solid links. Next up we have the Rolex Day Date “President” bracelet, as seen below. The President actually comes on either the bracelet seen below or a “PCL” gold oyster bracelet. The latter is far less popular. While the President appears similar to the jubilee bracelet seen above, the two are very different. This model is called the President because it has appeared on the wrist of many US presidents from Dwight Eisenhower to Lyndon Johnson. It is one of the most recognizable bracelets in the world. Here below we have the Rolex “Masterpiece” bracelet as seen on a Rolex ladies Pearlmaster with a factory diamond studded bezel and factory mother of pearl dial. The Masterpiece bracelet equips both men’s and women’s Masterpiece models, and often comes as “Tridor,” which is a combination of three precious metals to form one bracelet. The Masterpiece bracelet can also be set with diamonds at the Rolex factory, for a significant premium. Finally, we have below two types of leather straps Rolex uses on certain models. Usually Rolex uses leather straps (either alligator or crocodile) on precious metal models. You can find leather bands on Cellini models, Daytonas, Sky Dwellers, and Presidents. We have two types of straps below, one is alligator leather and the other crocodile leather. The alligator strap belonged to a yellow gold Sky Dweller, and featured a 18K yellow gold hidden clasp. The crocodile strap was on a Cellini, and featured a simple 18k yellow gold buckle. We have covered just about every type of Rolex bracelets and straps there is. Purchasing your next Rolex is a big decision, so make sure to find the bracelet or strap most comfortable for your wrist. Some bracelet styles and clasp types offer more adjustability than others. While style matters, fit is equally important. Ah the Rolex Mercedes hour hand, the iconic look that has become synonymous with Rolex for nearly a century. We find it on many of the most popular Rolex models in the world: Submariner, Explorer, GMT Master II to name a few. There are many hypotheses as to why Rolex uses this symbol on many of its timepieces. First people speculated a connection between Rolex and the German carmaker Mercedes. Then many surmised it was because Mercedes Gleitze, the first British woman to swim across the English channel, wore a Rolex oyster around her neck on her second attempt to cross the channel. Another hypothesis is that the hand stands for the three stars: land, air, and sea. Land is the Explorer lineup, air is the GMT Master lineup, and sea is of course the Submariner and Sea Dweller lineup. The true reason is much simpler than all the suggestions above. Collectors and enthusiasts generally agree, Rolex used the Mercedes hour hand for purely functional purposes, that the shape allowed maximum lume paint to be applied. True to Rolex company heritage, practicality and functionality always take precedence to all else. The Rolex Milgauss GV is hands down one of our favorite models in the entire company lineup. It is one of the most interesting and unique watches on the market today. Re-introduced in 2007, the Milgauss actually comes in three versions. Besides being one of the few models in the watch world to have its movement enclosed in a Faraday Cage, the Milgauss also has an absolutely unique orange thunderbolt second hand. But the most distinguishable and interesting aspect of the GV is its green tinted sapphire glass. The glass tinting process reportedly took Rolex years to perfect and mass manufacture, and the Milgauss GV is the only Rolex model ever in Rolex’s history to sport a tinted color crystal. Rolex recently released a new GV model with blue dial that is currently selling alongside the black as seen above. We will do a comprehensive video and illustrative review on the Milgauss in our review section very soon. In the late run Rolex 16710 GMT Master II models, there emerged two new dial variations. The classic “roman” dial as seen here had been around for more than a decade. The two new dial variations are commonly referred to as the “stick” and “rectangular” dial. See below for comparisons. Here we have a standard “roman” dial (top) compared to a “rectangular” dial (bottom), one equipped on the last issue 16710 GMT Master II with 3186 movement. The rectangular dial is the rarer of the two “error” dials as some collectors like to call them. 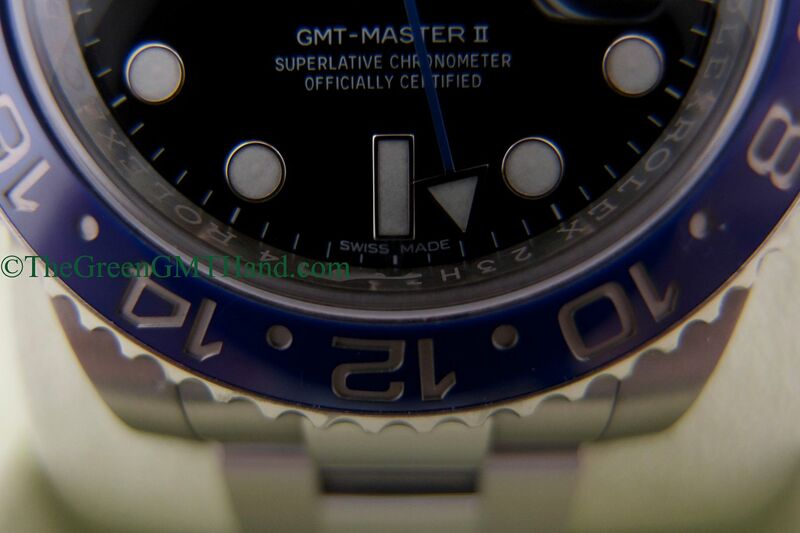 The “-” in “GMT-Master” is shorter and moved further left. The top and bottom strokes on the “II” are also shorter compared to a standard “roman” dial. Below we have a standard “roman” dial (top) compared to a “stick” dial (bottom). There is a posting further up about stick dials. One confusion many buyers have is to equate having a stick dial to having a 3186 movement. This is an incorrect assumption as we have seen many D and Z serial 16710 GMT Master II’s with standard 3185 movements that also have factory stick dials. Recently there has been a strong uptick in 16710 values, and we hope this post helps you identify the small but significant differences in the different models of 16710 GMT Master II’s. The 16710 is one of the most versatile timepieces we have ever seen. It comes in two bracelet options and three bezel color options; add in the dial and movement variations, there are many different combinations of looks. Here’s to hoping you will find the perfect one! This post applies only to Rolex timepieces, and not to any other watch brands. In general, new old stock Rolex timepieces refer to watches 3+ years old that have never been worn, and are still sealed with Rolex factory protective stickers/plastics. This could be due to a variety of reasons. For example, the watch could be from a low volume authorized dealer, who has not been able to sell the timepiece due to low foot traffic in its store. New old stock could also refer to a watch that was purchased by a collector, who then puts it in his/her safe to future keeping and hope for a price appreciation. In general, new old stock watches of currently produced timepieces are simply older, and do not command a premium at all. 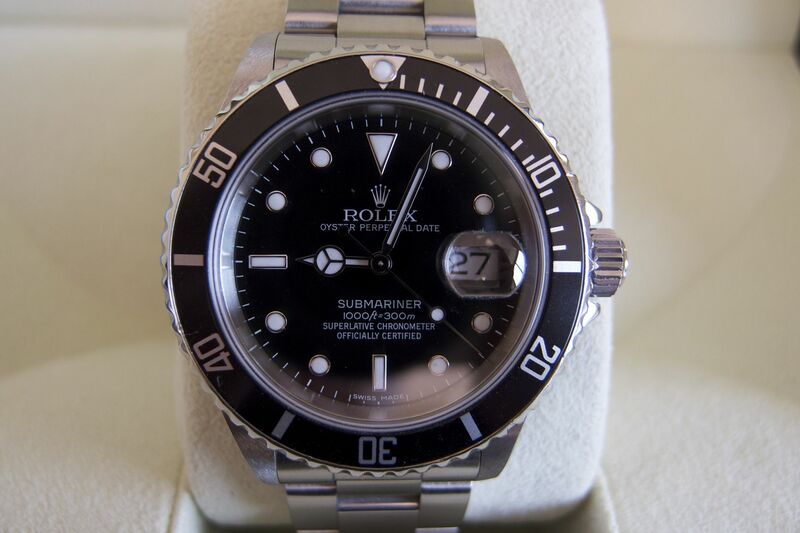 For example, if you were to produce a brand new old stock factory sealed V serial 116610 ceramic Submariner, when Rolex is currently producing the latest random series 116610’s, the V would most likely be sold for a slight discount, even though it is technically brand new. New old stock really carries a premium on permanently discontinued Rolex models. Serious collectors and enthusiasts alike pay special premiums for sealed new old stock discontinued pieces, especially popular ones such as the 16710 GMT Master II or the 16610/16610LV Submariner. So how do you distinguish a truly new old stock timepiece, especially of a discontinued model? The easiest way to identify a truly new old stock Rolex is to look for factory protective stickers. If they are tightly applied, then the watch is likely never to have been worn. Once the stickers are removed and the adhesives are exposed to oxygen, they will not reattach to the case/bracelet/clasp, or at least not as tightly as before. As seen above, stickers can comes in different forms. The top picture shows an older style timepiece from year 2006, and there is no bar code stamping on the case stickers whereas the bottom picture shows a 2009 new old stock timepiece with factory identification bar coding. 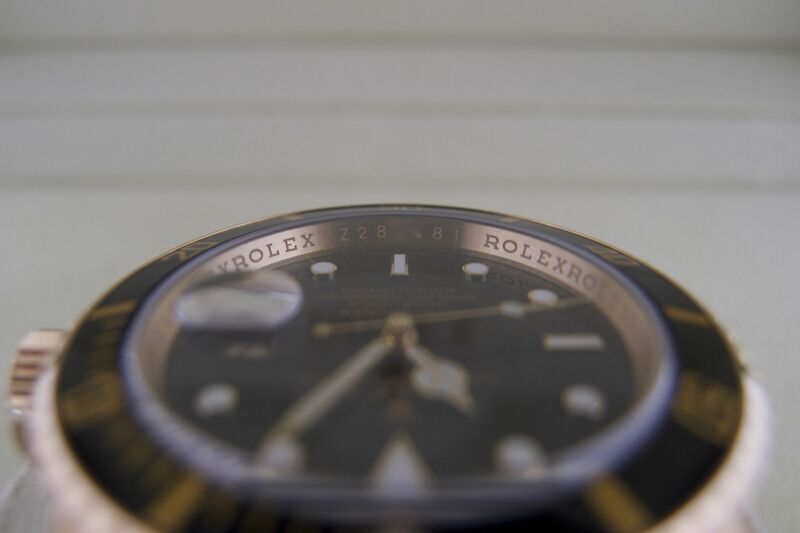 If you are purchasing a new old stock Rolex from prior to 2006, and the watch still has stickers, it should not have a bar code as the practice began in year 2006. New old stock can also refer to timepieces from the 80’s and 90’s as we have seen many online sellers use the term loosely. This is slightly problematic because 99.9% of the time, the watch in question is without factory plastic stickers. That begs the question, what if the watch was worn, and then refinished to look new? There is really no right answer or foolproof way to tell, but buy the seller. If you seller is a trusted source, then an advertised new old stock Rolex without stickers should really be never worn new old stock. 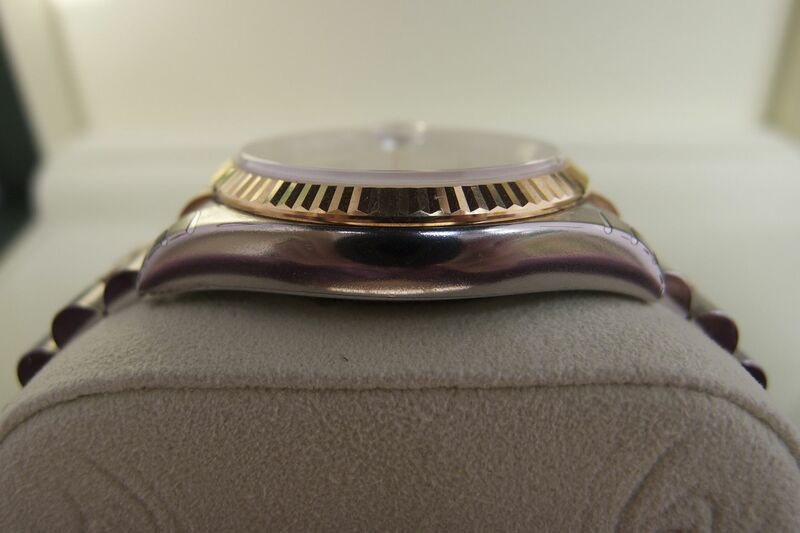 You can examine the case and bracelet finishing, the amount of chamfer if that applies, and overall just look for a Rolex factory finish like below. We hope this post will help you in your journey for the next Rolex, especially if it is a new old stock discontinued model. We find the search as fun as the final piece itself, and hope you enjoy the hunt as well. 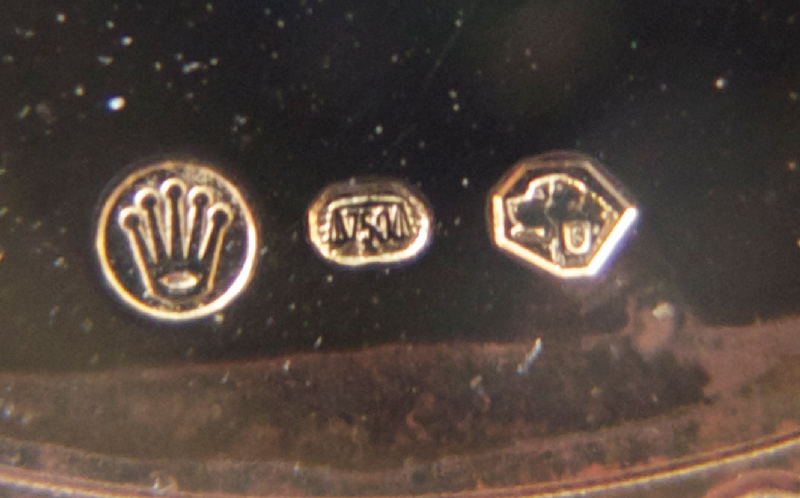 The title may sound odd, but this is a very useful and informative post about Rolex precious metal stamping that we hope will help you better understand the stamping process and look out for counterfeits! 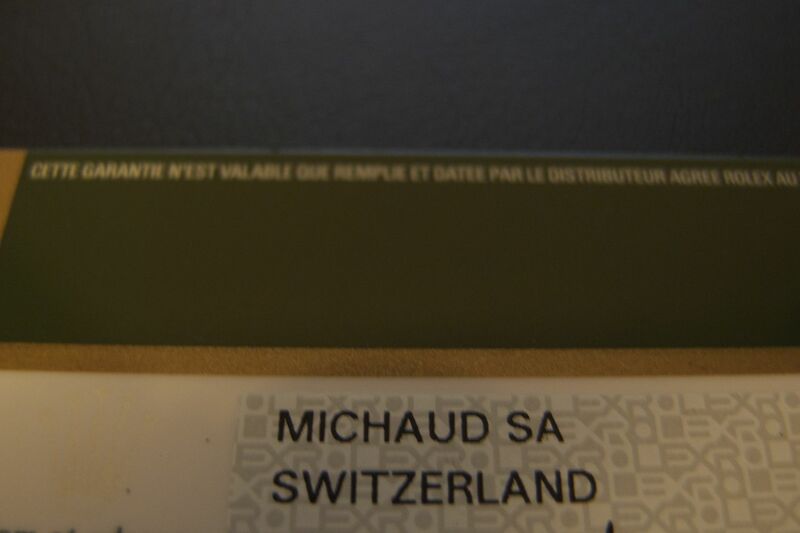 There are 7 official Assay offices in Switzerland, and each office is designated a special letter/sign. Of course, Rolex moved its base of operations to Geneva in 1919, and uses the letter “G” in its watch stampings. Below is a chart for precious metal Rolex watches manufactured prior to August 1st, 1995. “Gold 585” means the watch case is made out of 58.5% 24K yellow gold. In the case of Rolex timepieces, the “X” found in each symbol is replaced with the letter “G,” which represents the Geneva assay office. After August 1st, 1995, the law was modified such that all watch cases made of gold, silver, platinum or palladium, of foreign or domestic manufacture, sold in Switzerland, are subject to inspection and compulsory official marking. Instead of the chart above, there is now a single official hallmark for all precious metals and all purity standards, the head of a St. Bernard dog as seen below. Once again, the “X” is replaced with the letter “G” in Rolex precious metal timepieces. 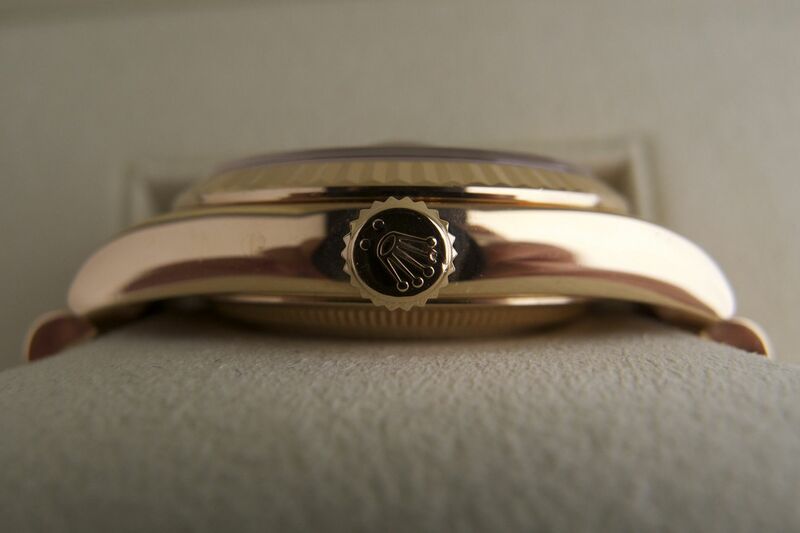 This symbol is not only stamped on the watch case, but also on bracelet clasps. 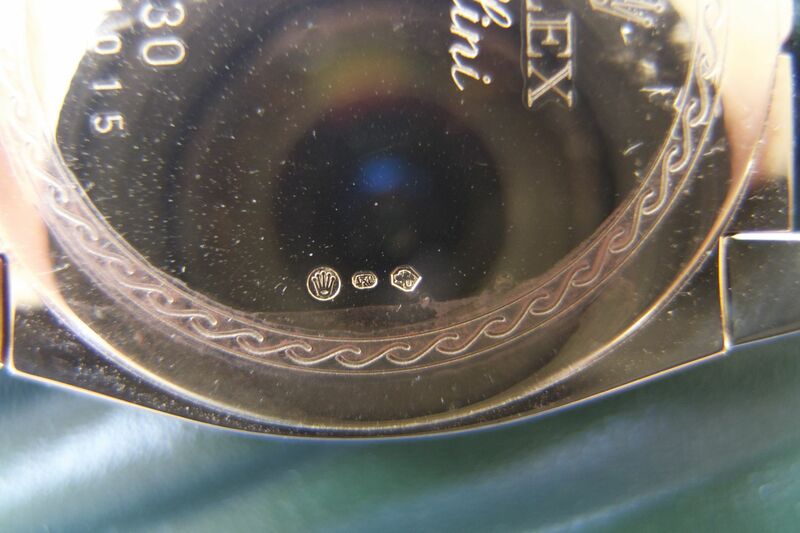 Here are some pictures below of the back of a 18K yellow gold Rolex Cellini, both standard size and zoomed in. The lovely St. Bernard the dog is clearly seen on the right, with the letter “G.” There is also a 750 stamp underneath a scale, for 18K 75% gold purity, and the Rolex symbol is stamped on the left. The same St. Bernard stamp is found on the 18K yellow gold buckle of the same Cellini, as clearly seen below. The dies used to stamp the timepieces are strictly kept securely in the assay offices, and they never leave the offices. These stamps are essential Swiss government hallmarks, and the level of detail is virtually impossible to copy. With a loupe, you can identify the beautiful details on these stamps found only on genuine Rolex precious metal watches. If you are fortunate to own a precious metal Rolex (excluding two tone), take out the loupe or magnifying glass and find that stamp! In the past year, Rolex has begun to update many of their current models with chromalight blue lume materials. Chromalight was introduced in 2008 on the Rolex Deep Sea REF 116660, and many newly redesigned models such as the Milgauss, Submariner ceramic, and Explorer REF 214270 and Explorer II REF 216570 have all used chromalight since their introductions. But lately Rolex has phased out luminova on models such as the 116520 Daytona and 116710 GMT Master II ceramic, two models that come equipped standard with green luminova lume. We have a lengthy post above on the differences between tritium, luminova, and chromalight, but to help buyers understand the difference between luminova and chromalight in the simplest and quickest fashion, please refer to the picture below. Here is another contrast picture of chromalight on a Rolex 116610 ceramic Submariner and luminova on a Rolex 16610LV 50th anniversary Submariner. Simply, chromalight is blue (supposedly the lume stays illuminated considerably longer compared to luminova), and luminova is green. If you are buying a currently produced model with lume material painted onto the dial and/or hands, and have a preference for either chromalight (newest) or luminova (discontinued), we hope this post helps you in the decision making process. We hope this post serves as an useful reference guide for buyers searching for their next discontinued REF 1661X Submariner. There are six different dial options, excluding the unique mark dial variations. Stainless steel 16610 and 50th anniversary 16610LV have the following two dial options. 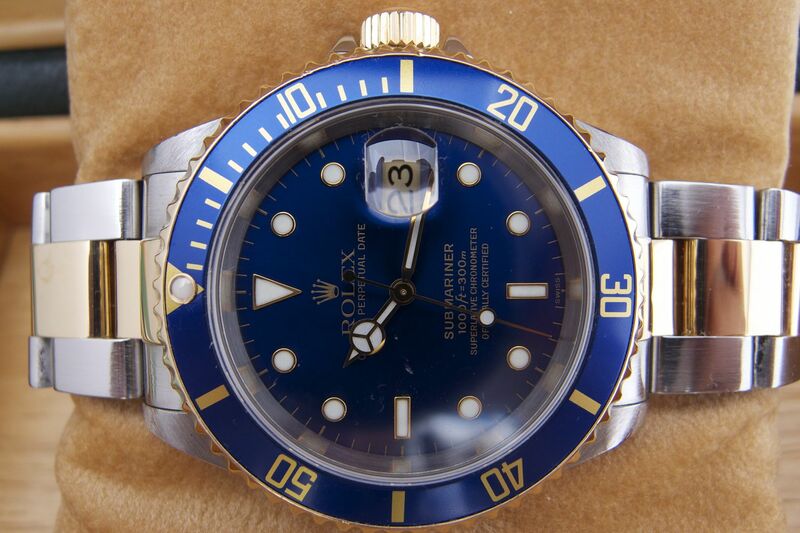 Both REF 16613 two tone steel & yellow gold and REF 16618 solid yellow gold (Rolex did not produce a white gold 1661X Submariner, but there is currently a 116619 ceramic white gold Submariner blue/blue diamond dial) arrive factory equipped with either of the following four dial options. To make sure your dial is not a later swap in or an aftermarket dial, be sure to examine the paperwork. You can either use the reference number or the warranty card. 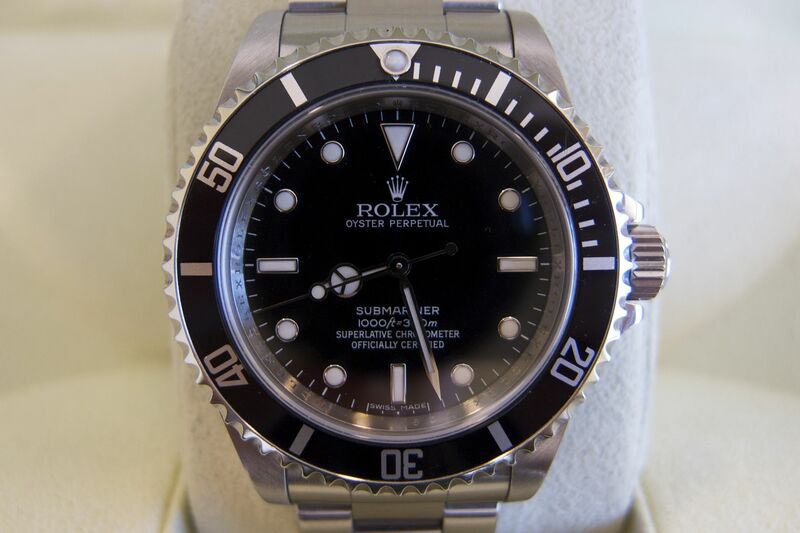 For example, a 16610 with black dial will have reference number 16610, whereas a black maxi dial 16610 is an anniversary Submariner and the warranty card will state either 16610V or 16610LV. A black dial 16613 or 16618 will be 16613LN/16613N/16618LN/16618N, and a blue dial 16613 or 16618 will be stated on the warranty card/certificate as 16613LB/16613B/16618LB/16618B. The serti diamond and sapphire dials will also be designated in writing on the warranty certificate/warranty card. See below for examples of properly documented factory correct Submariners. While the picture above features two modern warranty cards, the same dial designations can be found on older certificates as well. We hope this post helps you to understand and identify the appropriate Submariner dials options and verifications methods. Rolex and Tudor are just two Swiss brands that install helium escape valves (HEV) on some of their dive watch models. 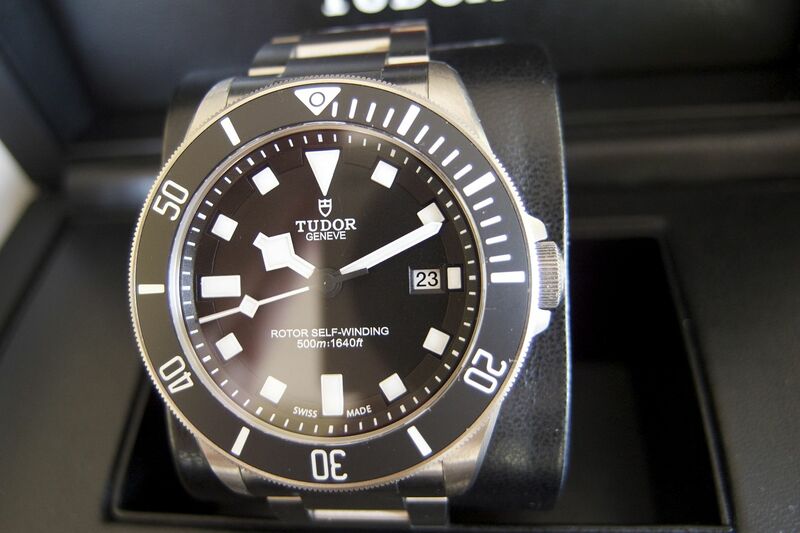 Tudor in 2012 introduced the first ever watch in company history to come equipped with a HEV: the Tudor Pelagos. Rolex currently uses the HEV on its 116660 Deepsea and 116600 ceramic Sea Dweller models. But why do Rolex, Tudor, and many other Swiss brands such as Omega use the HEV? Seen above is the Tudor Pelagos 25500TN helium escape valve. Notice the HEV and case metal match in color. This is because Rolex and now Tudor uses titanium to construct the HEV, and because the Tudor Pelagos is completely made out of titanium, there is no color difference between the case and the HEV. Note the difference below on a Rolex Sea Dweller 16600. The Rolex 16600 Sea Dweller case and bracelet is constructed from 904L steel, while the HEV is titanium, whose color is noticeably darker than the stainless steel case. Below is a Rolex 116660 Deep Sea, whose HEV and caseback are both constructed from titanium. Notice the greatly thicker case on the Deep Sea- this watch is a beast of a timepiece on the wrist. As is the case with all Rolex technological advancements, practicality trumps all else. The HEV was installed on the Rolex Sea Dweller lineup in the 1960’s to combat the problem posed by helium gas molecules. When divers venture into great depths, they usually breath a mixture of breathing gas that contains helium, which is the smallest gas particle found in nature. Helium is able to bypass the Rolex seals and o-rings, and finds its way into the case and consequently the movement. Problem occurs when divers de-compressurize during the resurfacing process, and the pressure difference will increase between the already trapped helium and the outside environment. 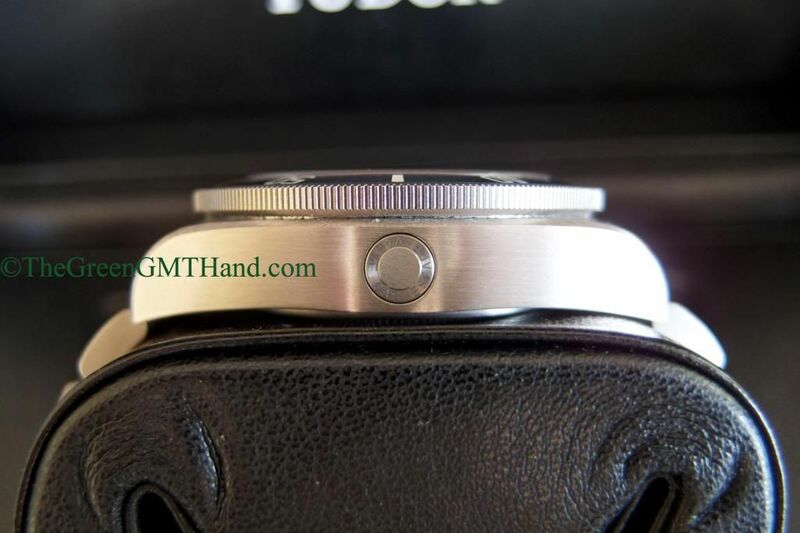 This can lead to crystals popping off, then the bezel, and can severely damage the movement. Rolex and Doxa watch companies partnered in the 60’s to invent the HEV, a mechanism that allows helium gas molecules to escape the case when the pressure difference between outside and inside the movement becomes critical enough to endanger the watch structural and performance integrity. Today, each HEV in the Rolex and Tudor families is made of titanium, and it is not found on all diver models. Tudor Black Bay does not have a HEV, and neither does the Rolex Submariner REF 116610/116613/116618/116619. The HEV is reserved for the deep diver models that have depth ratings of 500 meters or more. Chances are 99.9% of Rolex and Tudor buyers will never reach those depths, but we do like to think of the HEV as the honorable badge of one bad diver’s watch! 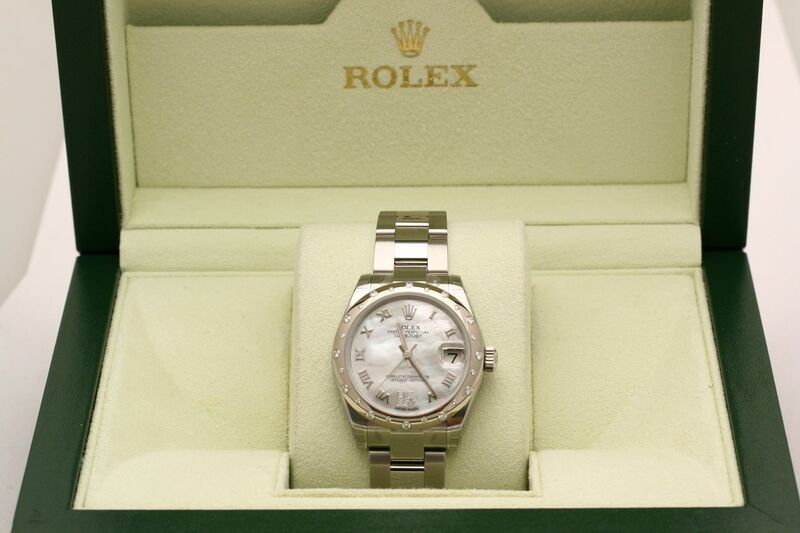 Rolex began the engraved rehault seen below in 2003/2004 on the Rolex Datejust lineup. This feature then slowly trickled into sport models as the Explorers and Submariners received the update in 2006/2007 in the mid to late Z series. In 2010/2011, Rolex ended the practice of engraving serial numbers at the 6 o’clock lug as it has done for many decades, so do not be surprised if you pick up a new model Rolex, pop off the bracelet, and the serial number is not there. On the engraved rehault feature as seen below, the serial number is engraved at the 6 o’clock beneath the crystal. 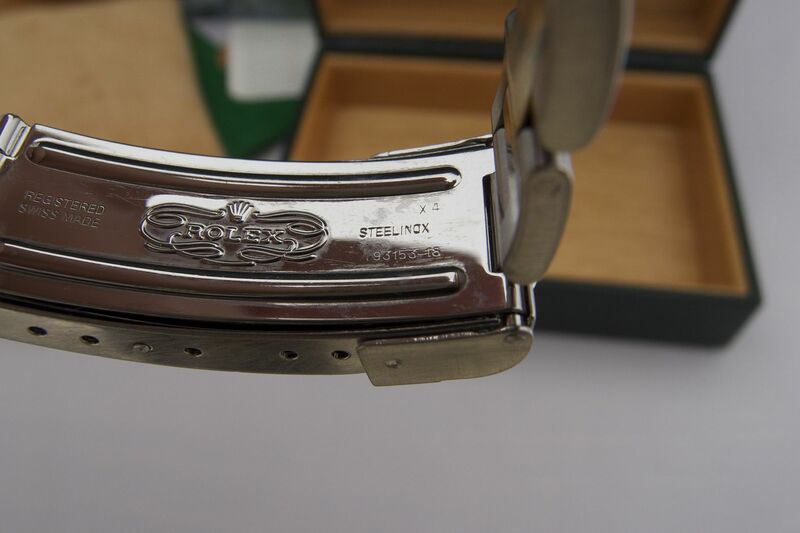 The serial number is surrounded by the word “ROLEX” engraved repetitively all around the rehault. Engraved rehault comes in any metal, both gold as seen above and stainless steel below. Why does Rolex use the engraved rehault feature now, and have since discontinued the traditional practice of engraving the serial number at the 6 o’clock lug? Only Rolex knows the real answer, but we suspect practicality is perhaps the biggest factor. It is a tedious process to remove the bracelet from the watch head, especially on modern “no holes” Rolex cases. Now the serial number is clearly seen under the crystal. Furthermore, the Rolex engraving on its watch rehault is absolutely perfect. The font, the strokes, and the spacing is perfect- every letter and number is also consistent. The difference between a genuine Rolex with factory engraved rehault and an non-genuine Rolex with imitated engraved rehault is like night and day. Thus the engraved rehault is also a very effective anti-counterfeit feature to the trained eye. Many times a buyer will prefer a clean traditional rehault or the newest engraved rehault. You will find discontinued models such as the Explorer REF 114270 that can cater to both types of buyers. Take a look at our pictures and decide for yourself if new or traditional is the way to go when you search for your next Rolex timepiece. The Rolex pearl lume dot at the 12 o’clock position on the entire diver lineup of Submariners and Sea Dwellers has been around for more than 60 years. You can find a Rolex pearl dot on the design of even the earliest of Submariners. When you deal with vintage Rolex Submariners, you will invariably run into some original bezel inserts that have a missing pearl from the wear and tear of decades of constant use. The Rolex pearl lume dot on modern divers is now designed to be much more durable, and we rarely ever see a modern post 1995 Rolex diver with a chipped or missing pearl on its bezel. Having seen so many timepieces over the years, we also find the pearl dot to be another hallmark of the perfectly made genuine Rolex. The perfect Rolex pearl is unmistakeable, and counterfeiters and Rolex design copycat brands simply are not able to replicate this timeless Rolex bezel feature. Let’s take a look at a genuine Rolex pearl dot below. This is the Rolex pearl found on a current ceramic Sea Dweller REF 116600. The size and fit are both perfect, and the setting cup is slightly raised from the bezel profile. Notice a shiny effect on the pearl, here it is again below on another slightly older late 2007 early 2008 bezel insert- the shine is very clear to see. There is a reason the Rolex pearl dot is very shiny, check out the Rolex pearl design below. Notice that Rolex adds a sapphire lens on top of the luminova fill (now replaced with chromalight on newer models), presumably both to protect the luminova/prevent pearls from falling out and to add a shiny layer that glistens along with the modern ceramic bezel. This very simple pearl design has proven extremely durable and functional, and acts as an excellent deterrent against counterfeits who simply cannot get the pearl size and appearance right. The next time you look down at your Rolex diver, know that like the rest of your watch, Rolex carefully engineered a simple small bezel pearl to be tough and beautiful at the same time, and certainly worthy of being on your wrist. 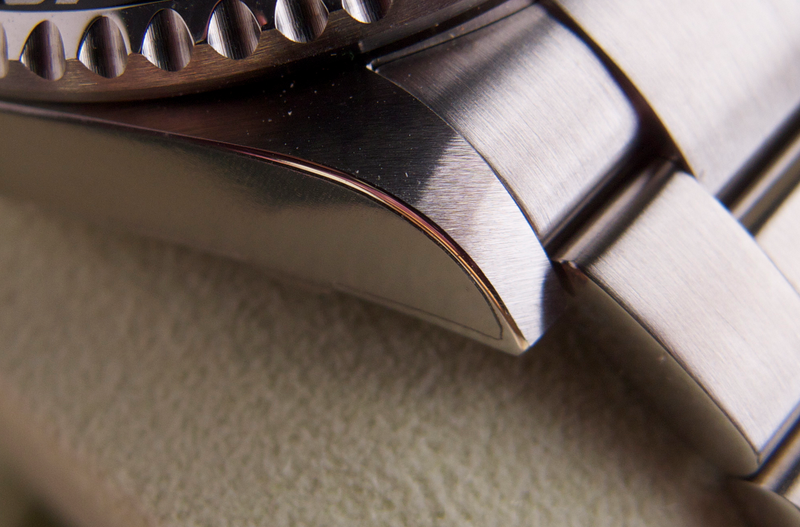 You will often hear the word “chamfer” or “bevels” when certain Rolex cases are described. This is especially important to vintage Rolex collectors. In this section, we will examine chamfering on Rolex cases from past to present. Chamfering is actually a term that can apply to many different industries. Furniture often has chamfered edges, your iPhone (before the iPhone 6 with its rounded edges) has chamfers. Swiss watchmakers have applied chamfering to their timepieces for centuries. The term is often confused with bevels- that is incorrect. See below for the difference. Let’s look at a picture of a vintage Rolex Tudor Snowflake, one that has never been refinished since original purchase, and see exactly what true factory chamfer is. This is Rolex factory chamfering at its finest. The watch is very old, it has been worn and it shows, but this Snowflake keeps all its factory finishing and collectors love that! Over the years, Rolex case chamfering began to disappear slowly from the company models, and the last true Rolex timepiece with prominent chamfering is the now discontinued Rolex 16600 Sea Dweller as seen below (a 2009 V serial model). This is a fine example of modern style Rolex case chamfering, it is just beautiful! 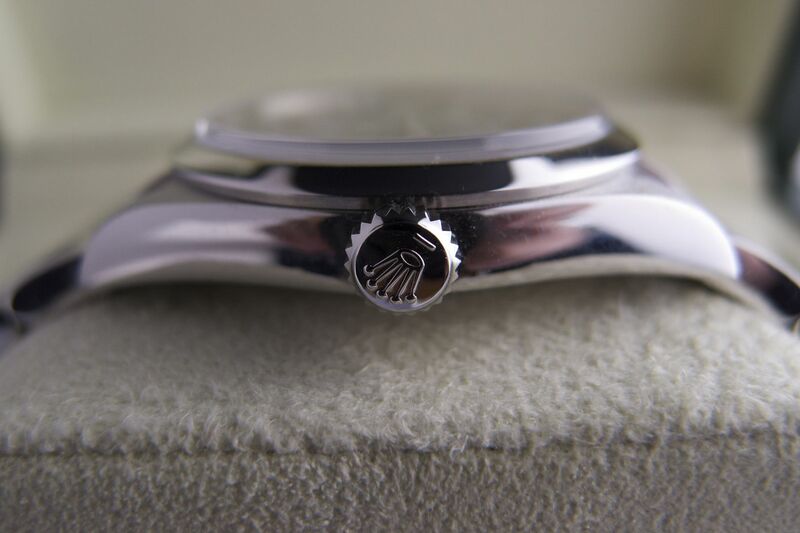 However, modern Rolex cases are milled by machine, and the final step is a human touch of hand finishing against a polishing wheel done by an actual Rolex technician, thus there will be variations in the prominence of the chamfer depending on the style and technique of the specific technician. As a result, we have noticed differing levels of case chamfer even within the same model. See below a 2008 M serial 16600 Sea Dweller- both this one and the V series seen above are brand new with factory plastic seals, yet the difference in factory chamfers is very noticeable as the latter is not nearly as prominent. Nowadays, chamfer has completely disappeared from Rolex timepieces, though you can still find them on Tudor models such as the Black Bay. But in Rolex, case chamfering is a thing of the past as the new blockier cases have completely eliminated it. See below for a current production Rolex 116600 ceramic Sea Dweller 4K, and notice that there is absolutely zero case chamfer. On the ultra luxury brands such as Patek Philippe or Audemars Piguet, you will still see plenty of chamfering on the case, and these companies actually take it a step further and chamfer EACH individual link on the bracelet as shown below. The amount of case finishing (often done by hand) such companies put into their timepieces is painstaking, and evokes the watchmaking techniques of a bygone era when watchmakers would produce entire timepieces by hand. 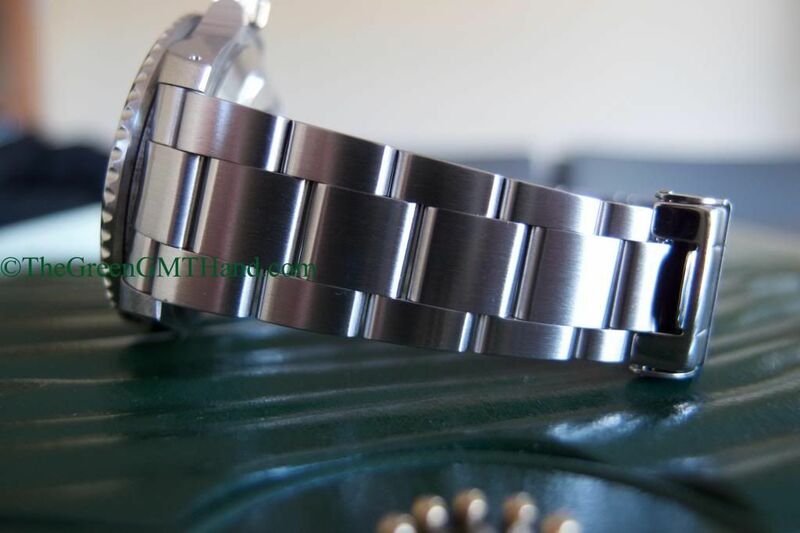 Therefore it stands to reason that additional case/bracelet finishing along with more decorated and hand finished movements both contribute to the significantly higher prices these brands charge for their entry level stainless steel models. Some could argue the Nautilus seen below is the “Submariner” of the Patek brand- a 116610 ceramic Submariner currently retails for $8,550 and the Nautilus $24,800! While the Patek is a more exclusive brand by far (1 million Rolex produced annually vs. ~50,000 for Patek), and the Nautilus uses a 22K yellow rotor, the price difference is still very significant. Additional case and bracelet finishing certainly play a part. For older vintage Rolex timepieces, chamfer is a definitive way to identify if the case has ever been refinished and to what degree. It is also an excellent hallmark of traditional watchmaking that still finds its place in Tudor, Audemars, and Patek, and is a thing of the past for Rolex. When we tell customers that at one point in Rolex’s glorious company history, certain parts were produced in Mexico, we are met with genuine looks of disbelief. After all, the Rolex brand is synonymous with quality SWISS timepieces, and prides itself today in designing, testing, and manufacturing nearly every component of every wristwatch that leave the Rolex factories. Rolex is a perfect representation of the vertical integration production model. Throughout the past few decades, Rolex has either acquired parts suppliers, or completely redesigned certain components of its timepieces to an end that now almost 100% of each Rolex is made completely in house. For example, the Rolex Daytona 16520 was made from 1988 to 2000 as the first self winding Rolex chronograph as all previous Daytona models were hand wound mechanical. This Rolex chronograph Daytona did not even have a Rolex movement. Swiss company Zenith produced the El Primero (Zenith caliber 400) self winding chronograph movement, and Rolex used it, downgraded the beat rate from 36,000 to 28,800 beats per hour, swapped out roughly 50% of its parts, and named it the Rolex caliber 4030. This Zenith movement was then considered the best chronograph movement in the world, but Rolex was not satisfied, and unveiled its own completely in house caliber 4130 that is now found in the REF 116520, 116523, and 116528 Daytona models. In fact, Rolex’s proprietary antimagnetic parachrom blue hairspring began in the caliber 4130. Such is the degree that Rolex will go to keep production in house, that even when its Daytona movements were based on what was considered the best chronograph movement ever made, that even after Rolex replaced 50% of its parts to make this movement better, this company still completely designed its own chronograph movement from the ground up to phase that movement out the door. The obsession with perfection and in house production is not just an advertisement line at Rolex! So to think that a great Swiss company such as Rolex actually produced a few of its watch components in Mexico, United States, Japan, and Argentina must be shocking to hear. People and sometimes even seasoned collectors who have not seen these watches may be quick to dismiss them as counterfeit, but they are indeed genuine. See below for an example of a Made In USA genuine Rolex bracelet. So why did Rolex produce such bracelets in the United States, Mexico, and Japan during the 70’s? The answer is simple: $$$. During that time period, Rolex was slapped with a suddenly spiked import tariff in certain countries, and to circumvent this increased import duty, Rolex decided to produce a component of the finished timepiece in the receiving country. It kept the production and assembly of the all important movement and case to Switzerland, and outsourced some bracelet production to said countries. Once the watch heads were imported (at reduced tariffs), the bracelet would be fitted to the watch head to form a completed wristwatch. A fun fact about the “JOSKE’S HECHO EN MEXICO” Rolex bracelets that are rarely seen. Joske’s was Texas’s largest department store chain, founded in 1867 by a German Jewish immigrant named Julius Joske. In 1987, the stores were absorbed by Dillard’s. 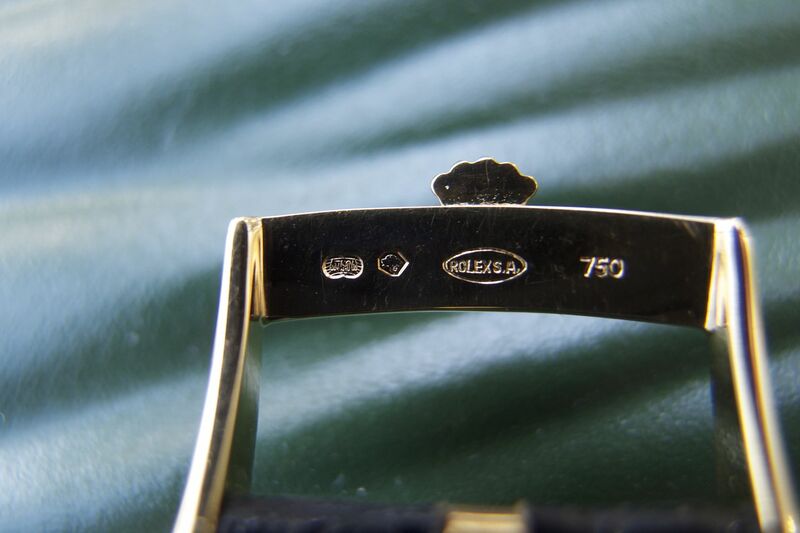 One thing we have noticed in our years of exposure to vintage Rolex and Tudor timepieces is the practice of hand engraved serial numbers on the clasp. You can see it in the picture above, and on this 1983 Rolex 16800 Submariner original 93150 bracelet below. This practice has been noted on many previously sold vintage Rolex and Tudor timepieces, and we are not even entirely sure if these watches came out of the factory with such engravings or if they were done at service to keep track of which bracelet belonged to which watch head. If you have any information on this, we would love to hear from you and add your contribution to solving this mystery. So the next time you see a Rolex USA or Mexico bracelet, do not be so quick to deem it a fake piece of junk, you may have just stumbled onto a very neat and rare piece of Rolex history! 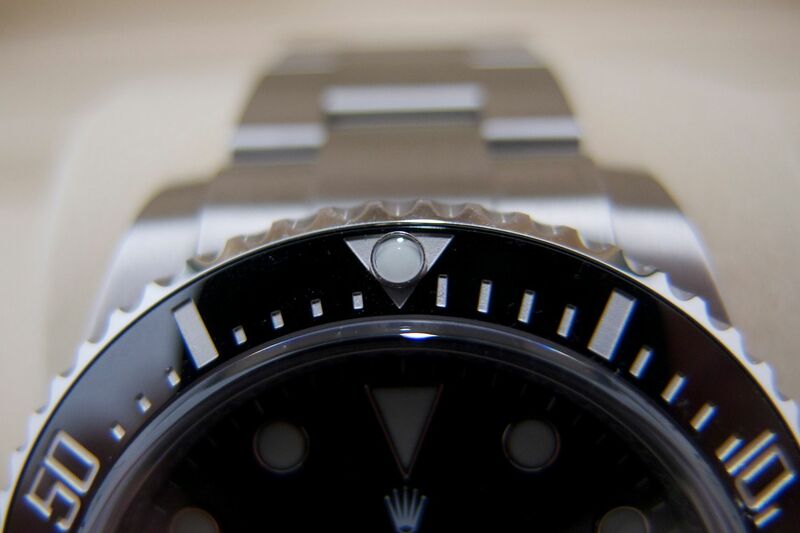 Rolex Twinlock and Triplock crowns have different dot designs as a subtle way to distinguish between Rolex metal materials used to produce said timepieces. A Rolex platinum Daytona may look similar to a stainless Daytona, but how would one like to find a stainless steel crown on a platinum timepiece? So Rolex has a practical system of distinguishing crowns, see the chart below. Note there are three columns. Column 1 is stainless steel watches, column 2 is two tone and solid yellow, rose, and white gold, and column 3 is solid platinum (95%). Let’s also see some real world examples. Below are two crowns found on two stainless steel Rolex watches, a Twinlock on a Rolex Milgauss 116400GV, and a Triplock on a Rolex Submariner 116610. Below are the Triplock on a solid yellow gold Rolex 116528 Daytona, and a Twinlock crown on a solid yellow gold Rolex 118238 Day Date President. Note especially the larger middle dot underneath the Daytona crown. Finally, see below for a Triplock crown on a platinum Rolex 116506 Daytona, and a Twinlock crown on a Rolex 118206 platinum Day Date President. Note this time on the Triplock the middle dot is the smallest surrounded by two larger dots. Platinum may seem visually similar to stainless steel, but Rolex has designed this system for easy distinguishing. The system is very accurate for most models except the Rolex Datejust. See below for what we mean. There is no crown design difference between a stainless steel Datejust and a two tone 116233 Datejust. And it’s been this way for a while… see below for a early 2000’s discontinued two tone Datejust 16233 and the same two tone Datejust found above. There is zero crown difference. However, even though the crown designs are identical between the stainless and two tone Datejust models, we can confirm that the solid 18K gold Datejust models indeed have the two dot design found on the 18K Day Date. We hope this post has been helpful in understanding the subtle differences among what seem like only small components of the Rolex timepiece. The Rolex roulette date wheel is simply an alternating date disk in which the odd days are in red, and the even days are in black. This rotating date feature can be found on the earliest Datejust models that date back to the mid 40’s. Compare below a standard all black date wheel with a roulette date wheel. The Turn O Graph REF 11626X models are special Datejust group that have an all red date disk. Every day, regardless if it is even or odd, is red on the Turn O Graph models, which have all be discontinued by Rolex. The hardest thing to answer about the roulette date wheel is which models have it. We have handled many different Datejust models, with smooth, fluted, and diamond bezels, and all kinds of dial colors and designs from stick, romans, to arabic. We have literally handled a brand new model with roulette date wheel and the next day handled an exact same reference number model with an all black date disk. The master catalogue is also no help because the information seems to change every year. In 2012, the Rolex master catalogue stated that only Rolesor (two tone) Datejust models would have the roulette, but that is no longer the case today. We do know that certain models do not have the roulette. No ladies Datejust ever has the roulette, so if you find one with it, the date disk is not original. No exotic dial such as Mother of Pearl, Meteorite, or ones with diamonds will have the roulette date wheel, of course unless the dial is not original to the watch. Other than this, we will not make any firm conclusions about which models have the roulette, only that it appears stick and arabic dials are more likely to be fitted with the alternating date disk from factory. It is a bit perplexing that even though Rolex is such an organized company, the availability of the roulette date wheel on the Datejust lineup seems completely random and down to the luck of the draw. It has been suggested by various prominent Rolex collectors that Rolex simply takes whatever available batch of date wheels is lying around and fits the Datejust models assembled that day with it. We doubt it though. If you have any reliable input on the subject matter, we would love to hear from you. Rolex made an industry-shaking move in late June, and it has been confirmed that starting on July 1st, 2015, all NEW Rolex timepieces sold in worldwide Rolex authorized dealers will now carry a full FIVE YEARS of factory warranty. This is a huge increase from the previous norm of Rolex’s TWO year warranty, which is standard across most major Swiss brands. Furthermore, Rolex has announced that all watches purchased new between July 1st, 2013 and June 30th, 2015, will receive free of charge an extra year of warranty. As seen below, the watch on the left will now have an effective Rolex warranty until September 2017 instead of September 2016. The Daytona on the right will see its warranty end in November 2017 instead of November 2016. Finally, Rolex has introduced a new service interval recommendation of TEN years! This is up from the current three to five year service interval recommendations you hear from Rolex. This is a strong testament to the faith Rolex has in the product it puts on your wrist, and the new warranty length goes to show how far Rolex will go to stand behind its product- very amazing! Besides Audemars Piguet with its additional third year of warranty, most prominent Swiss brands offer only two years of factory warranty. Let’s see how Rolex’s decision will affect the entire industry.